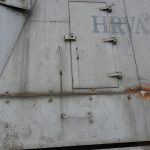 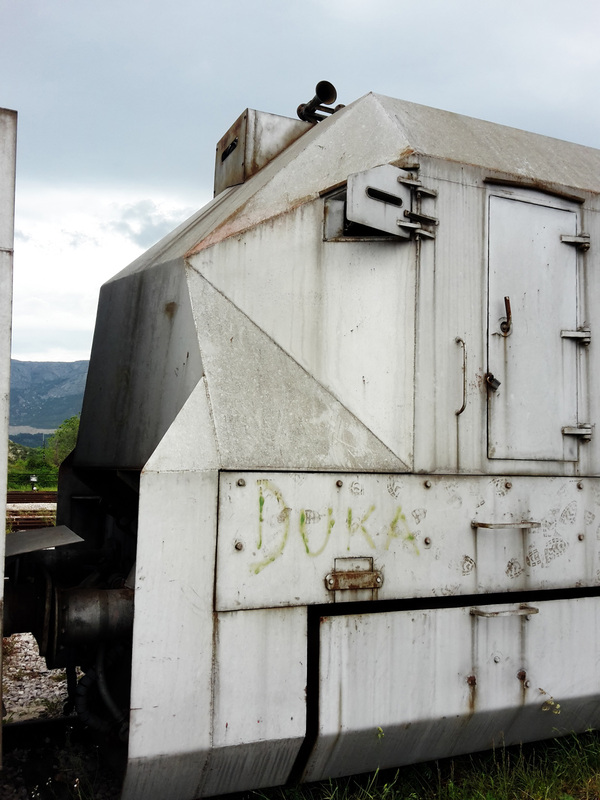 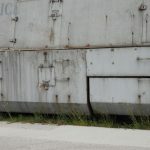 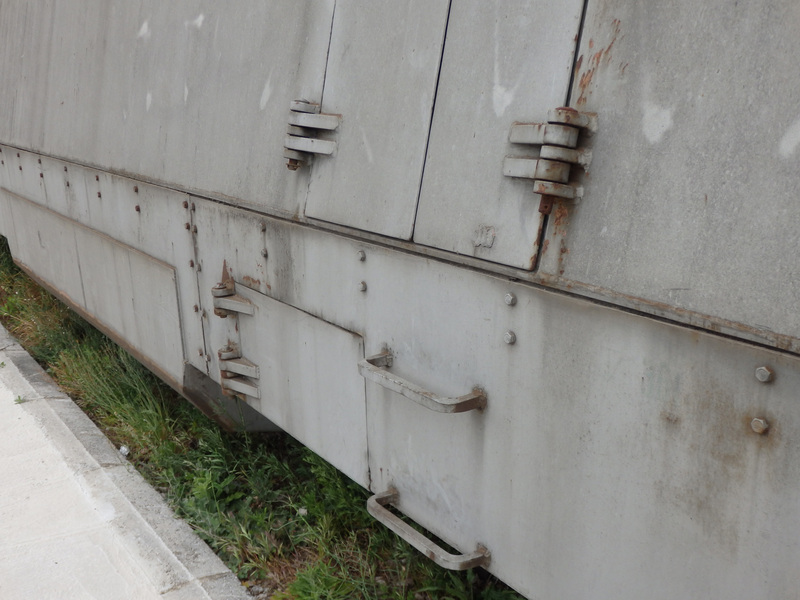 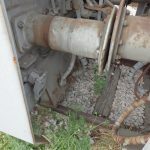 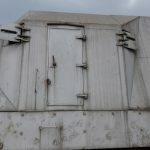 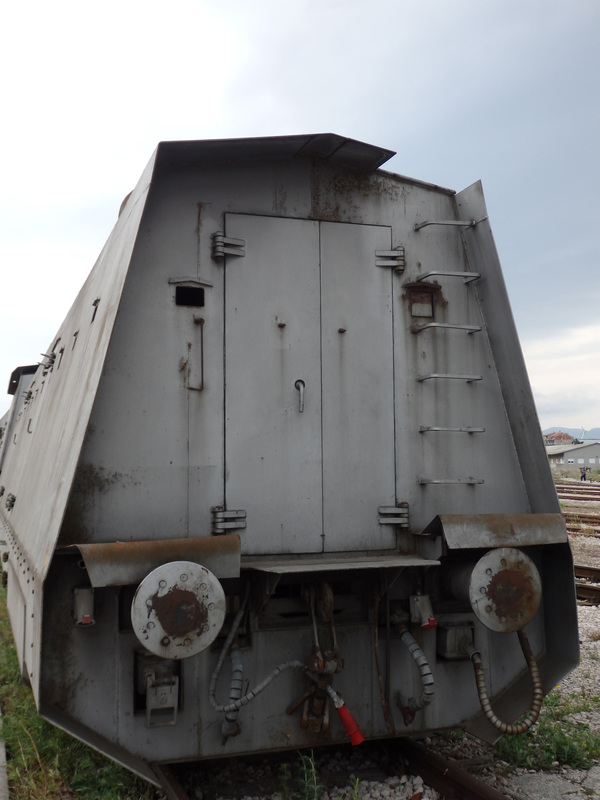 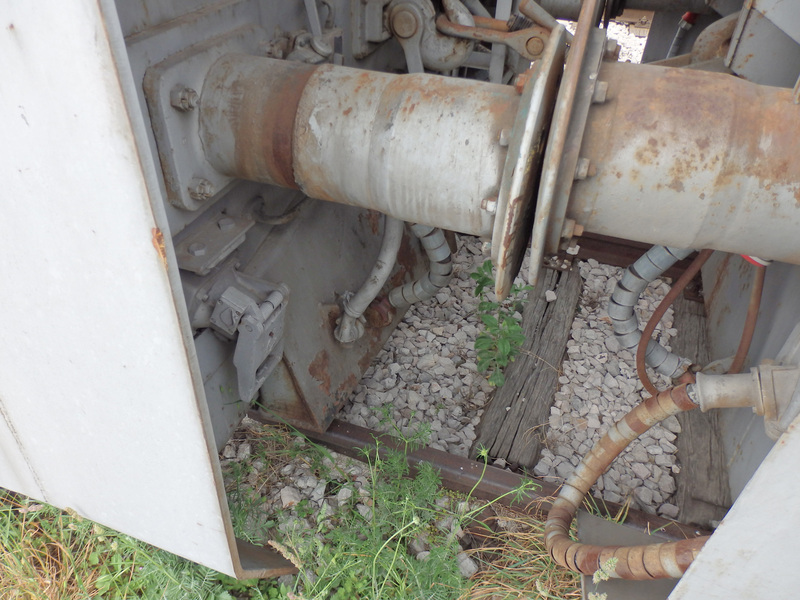 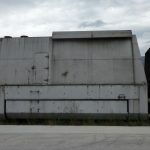 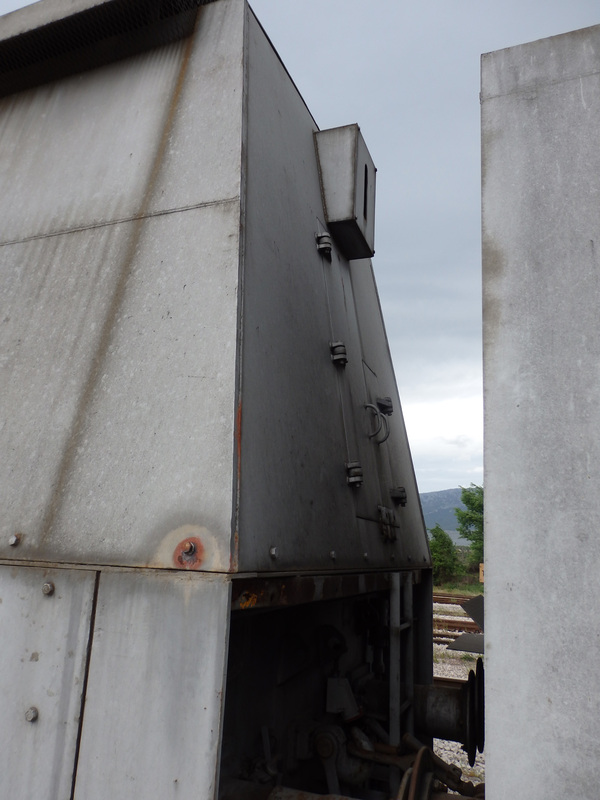 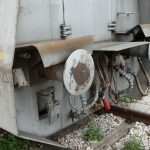 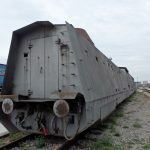 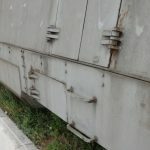 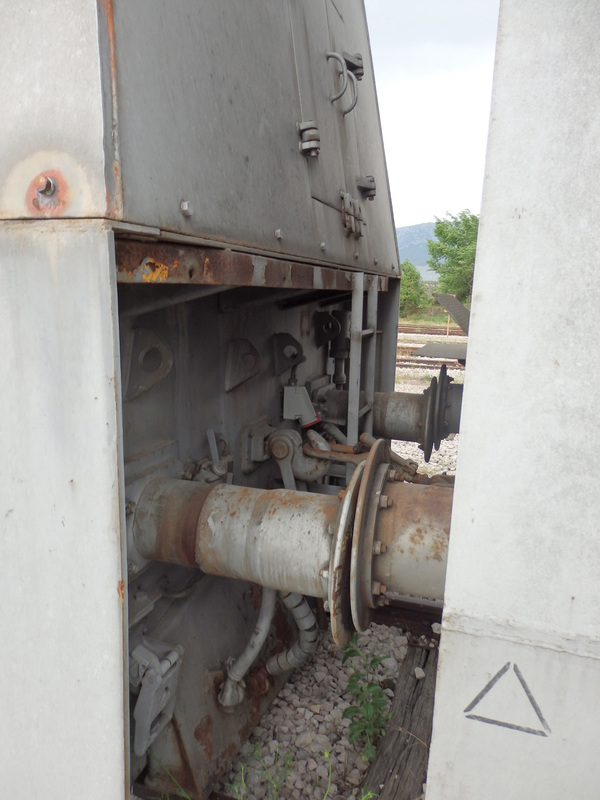 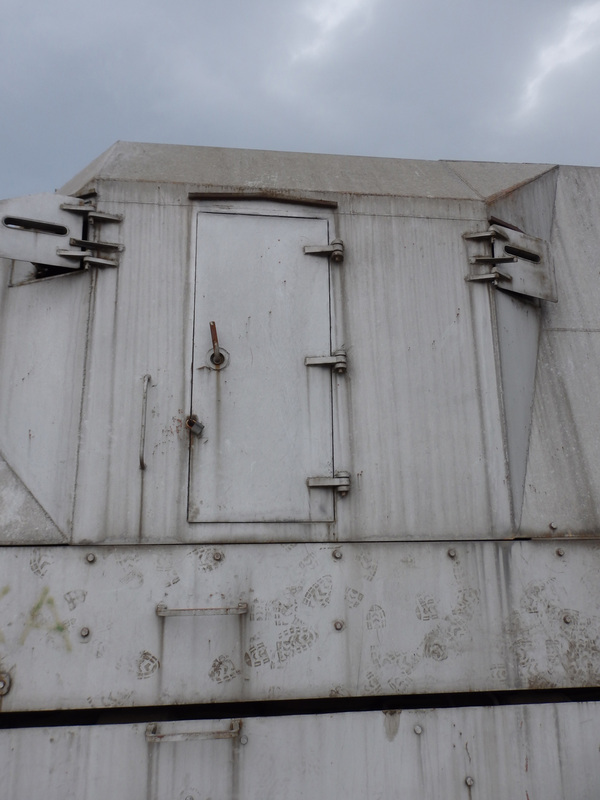 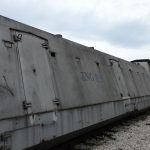 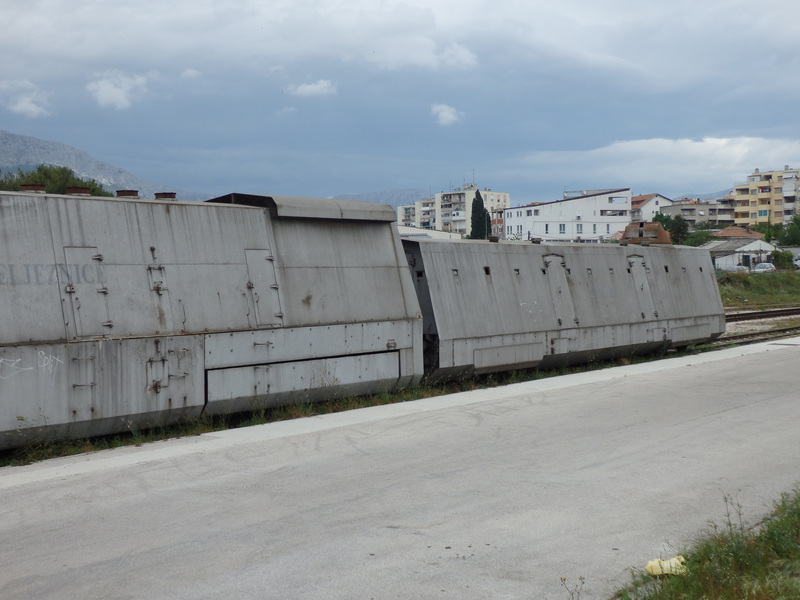 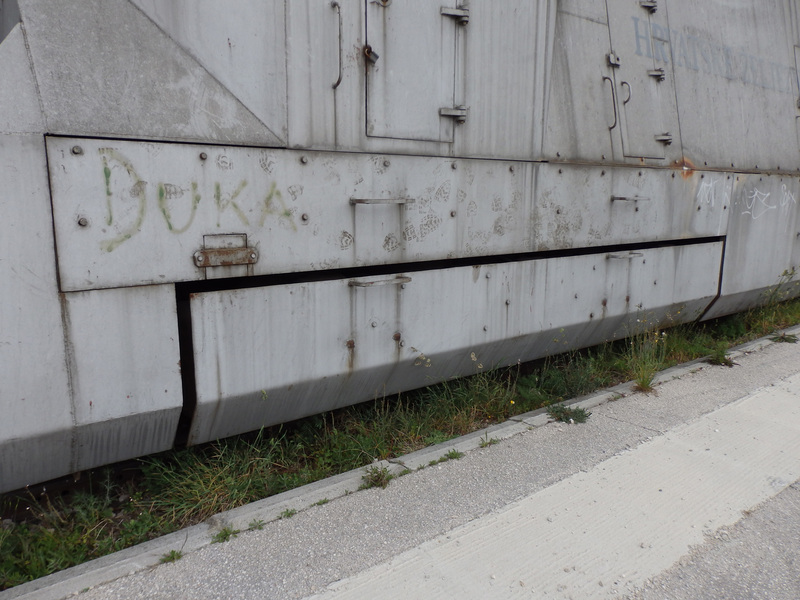 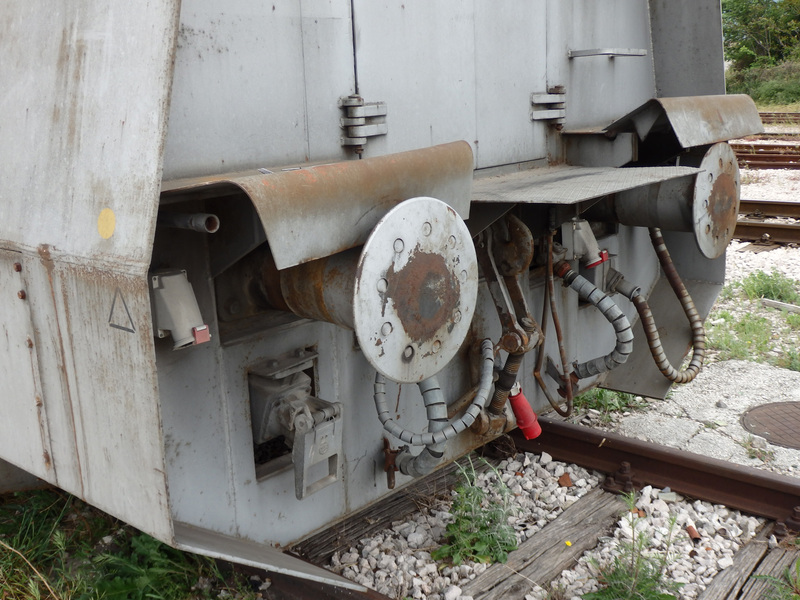 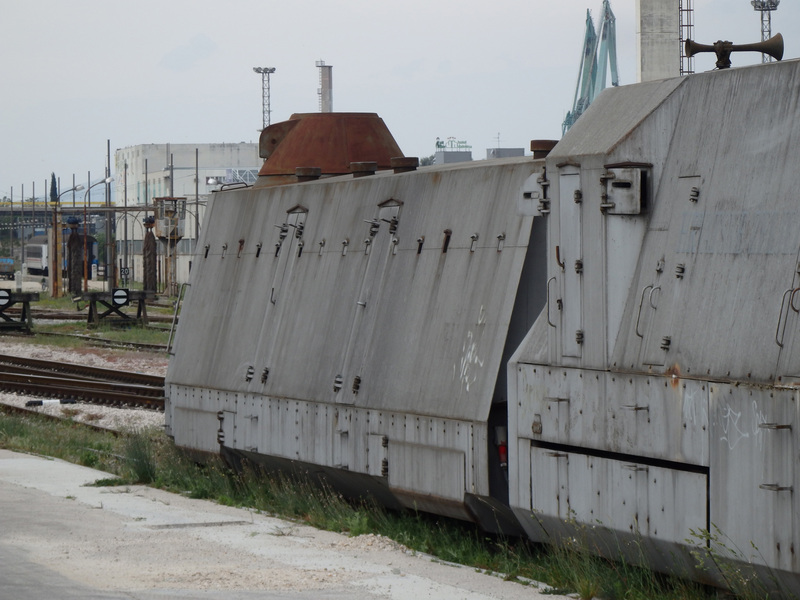 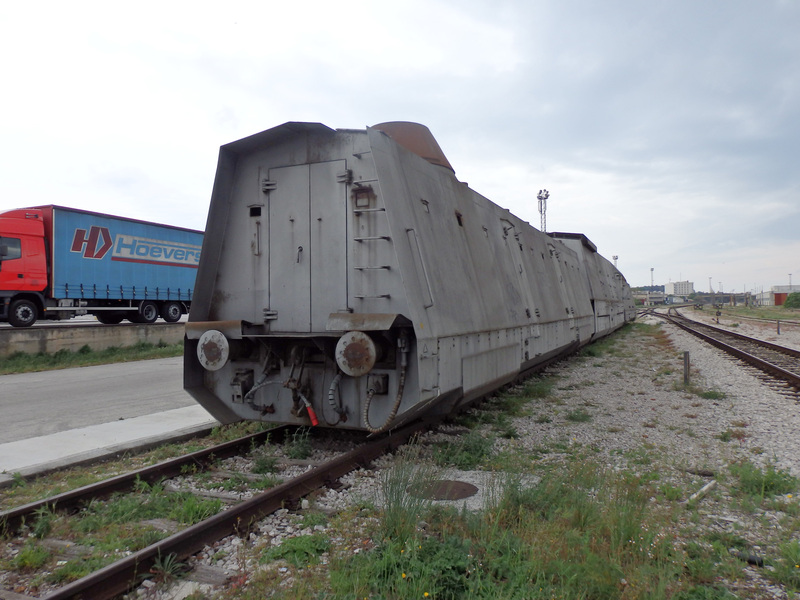 Croatian Railways’ rolling stock maintenance unit in Split completely rebuilt the wagons for the armoured train, retaining only the wheelsets, bogies and underframes. 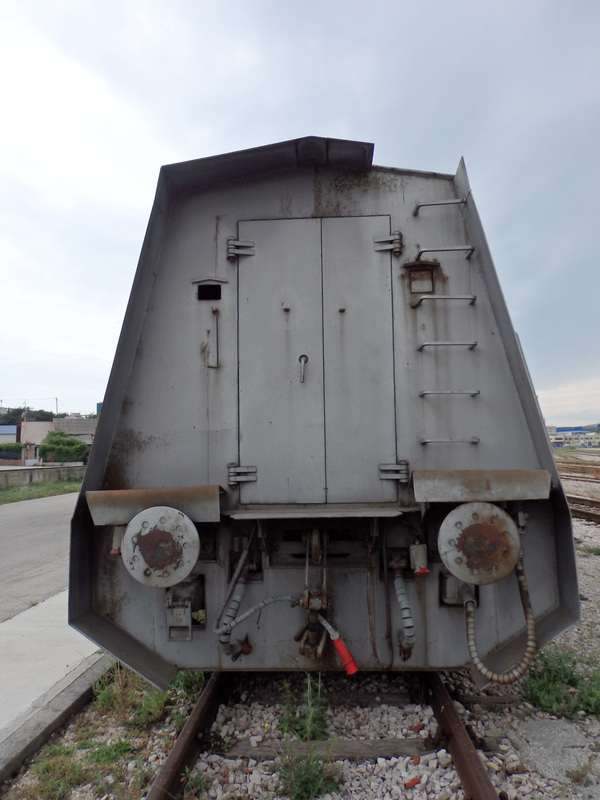 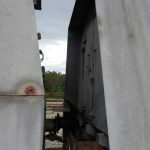 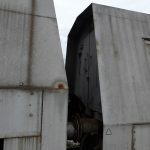 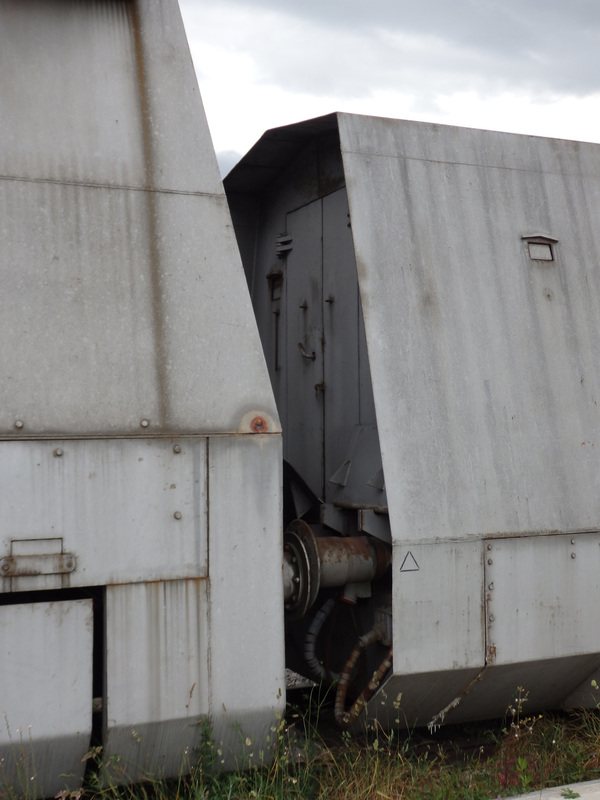 The buffers are a different shape on this wagon. 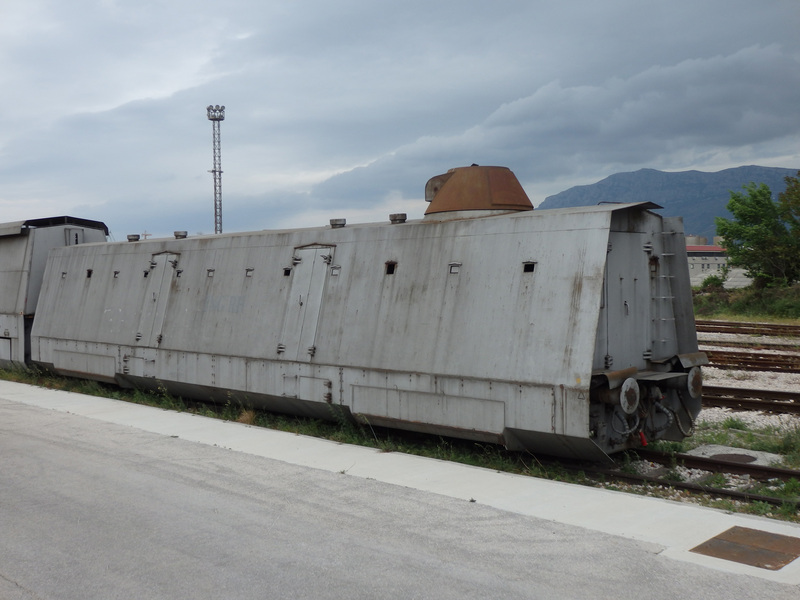 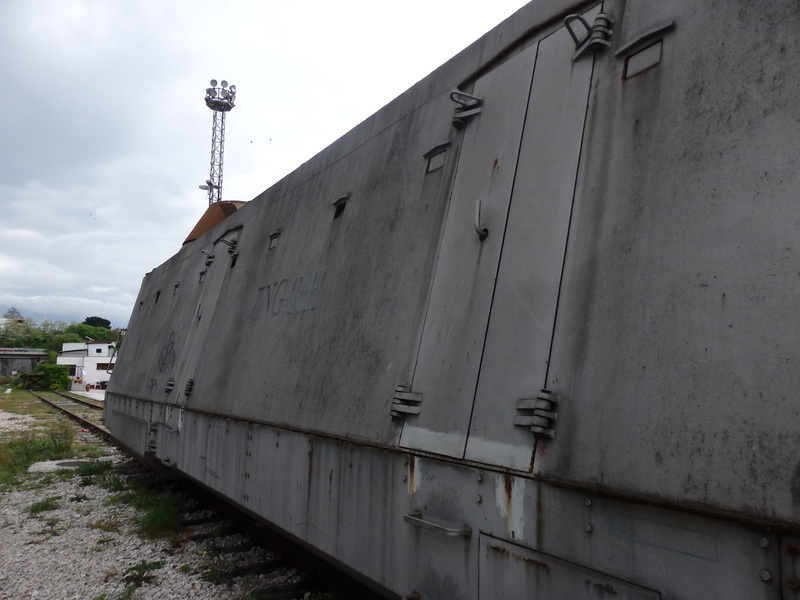 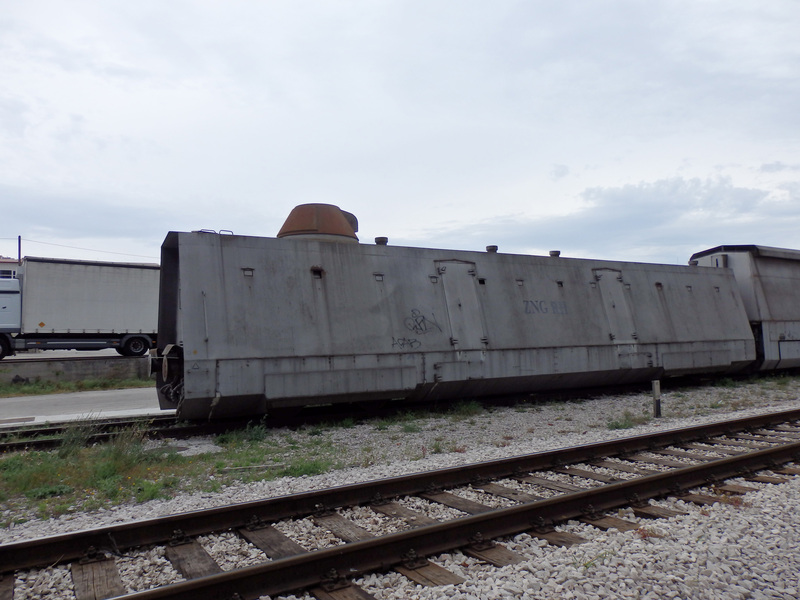 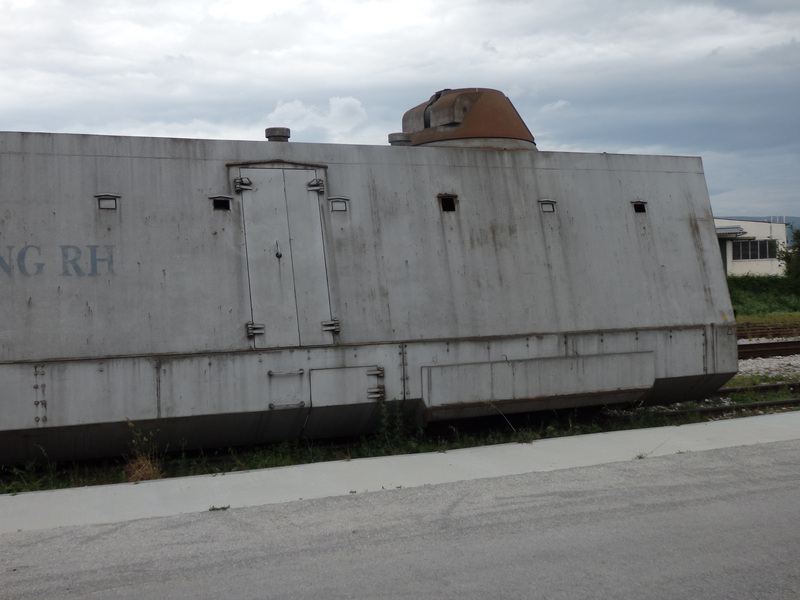 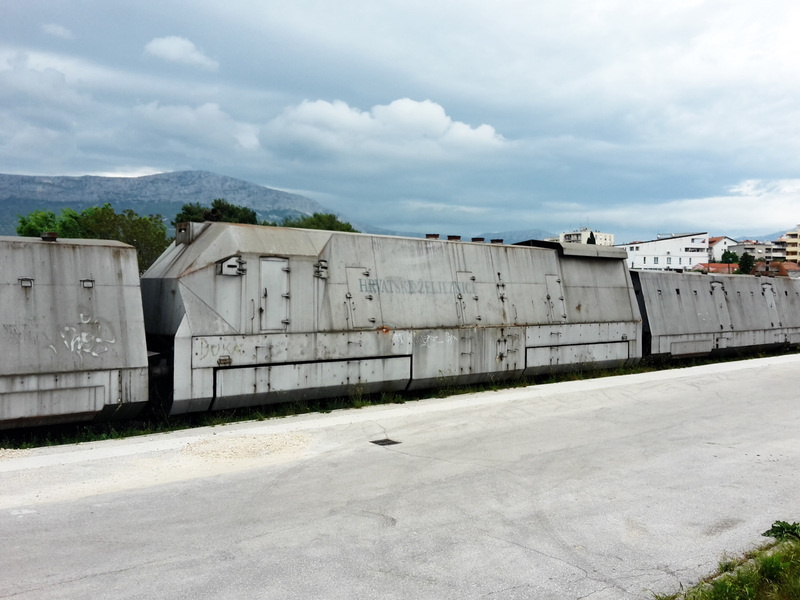 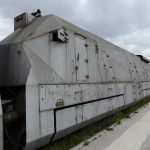 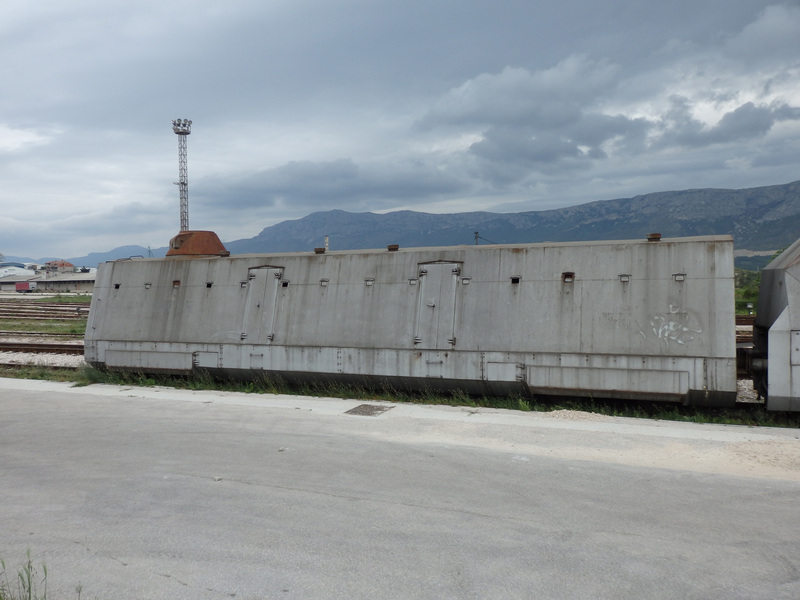 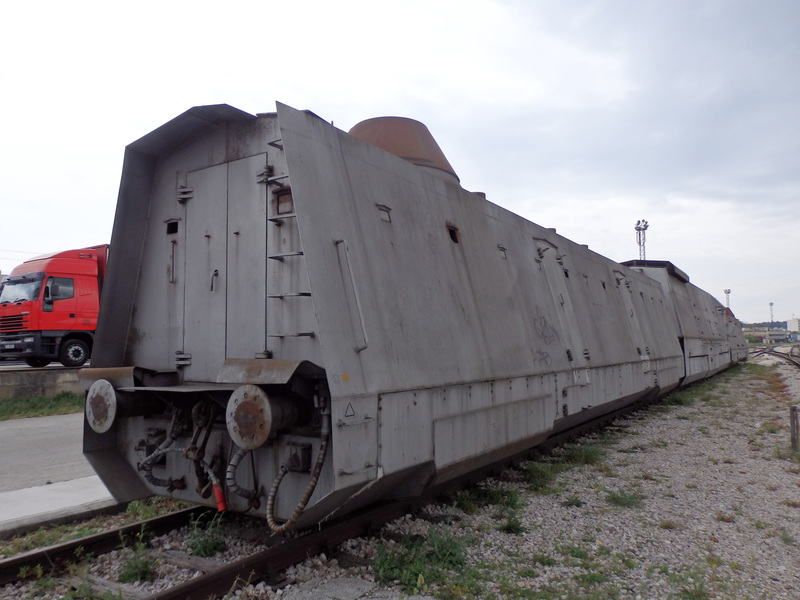 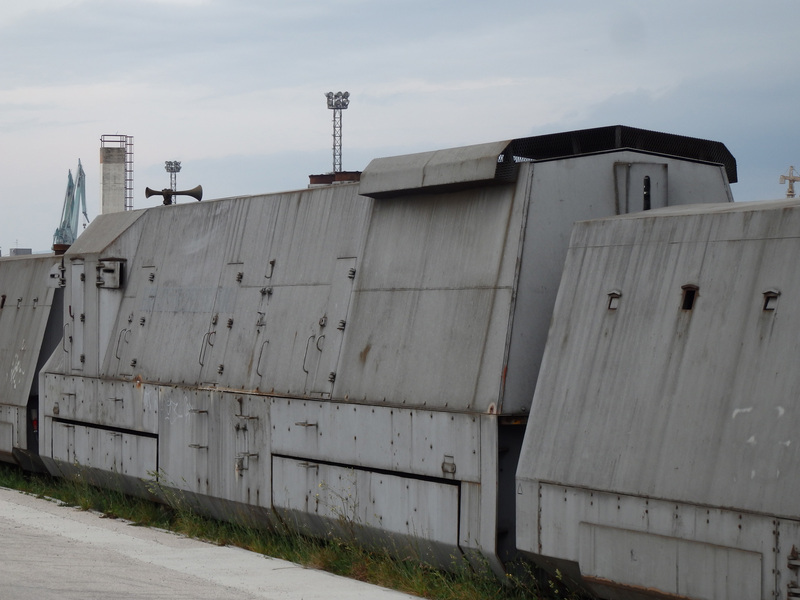 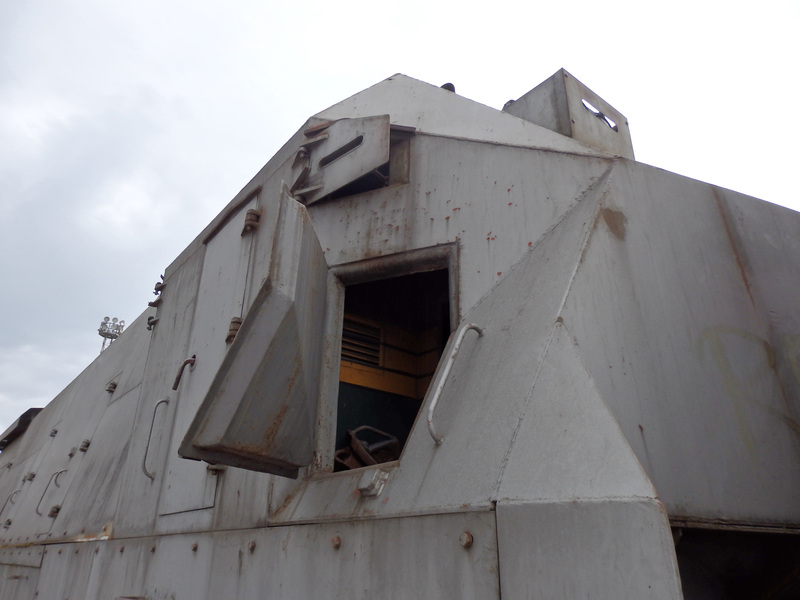 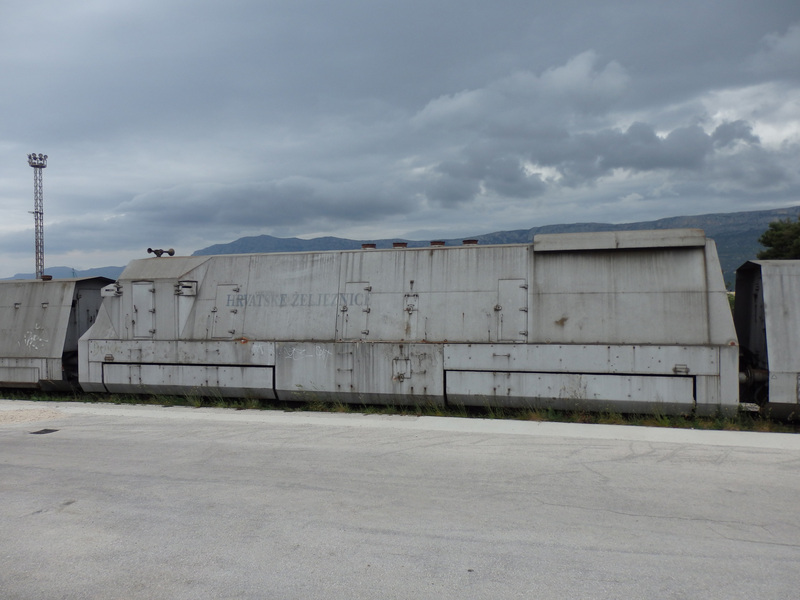 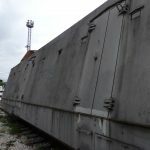 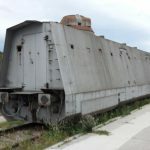 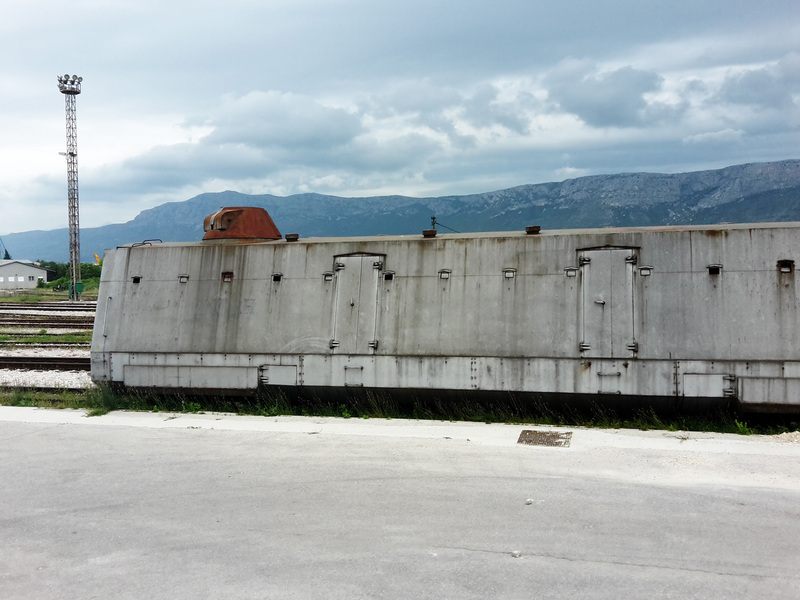 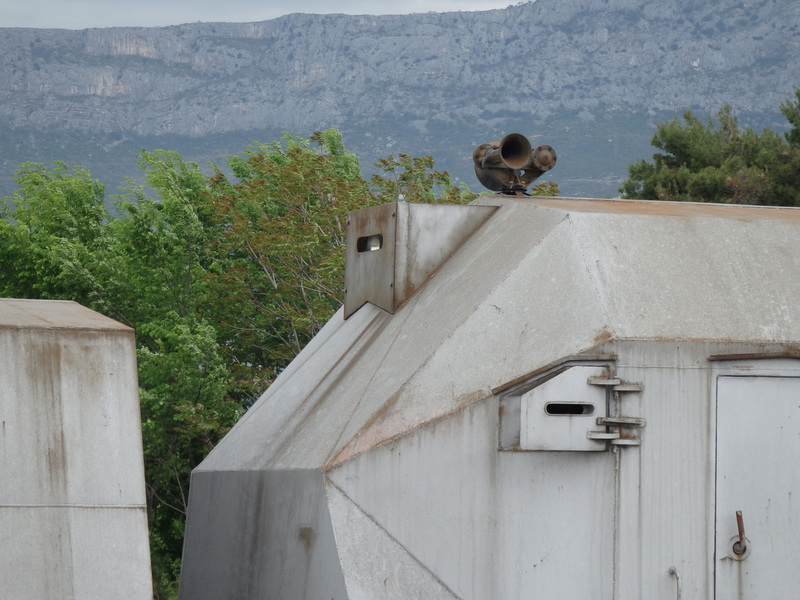 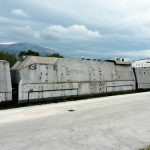 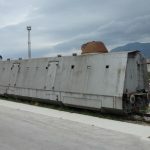 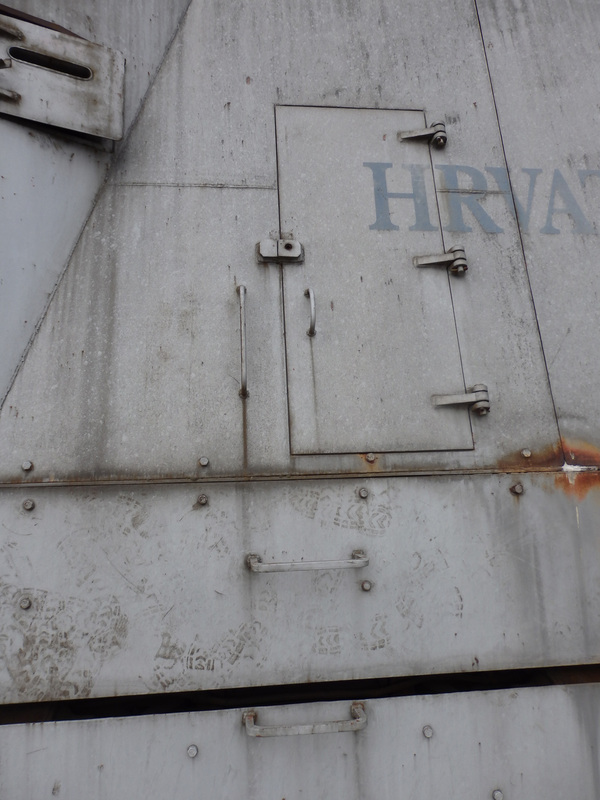 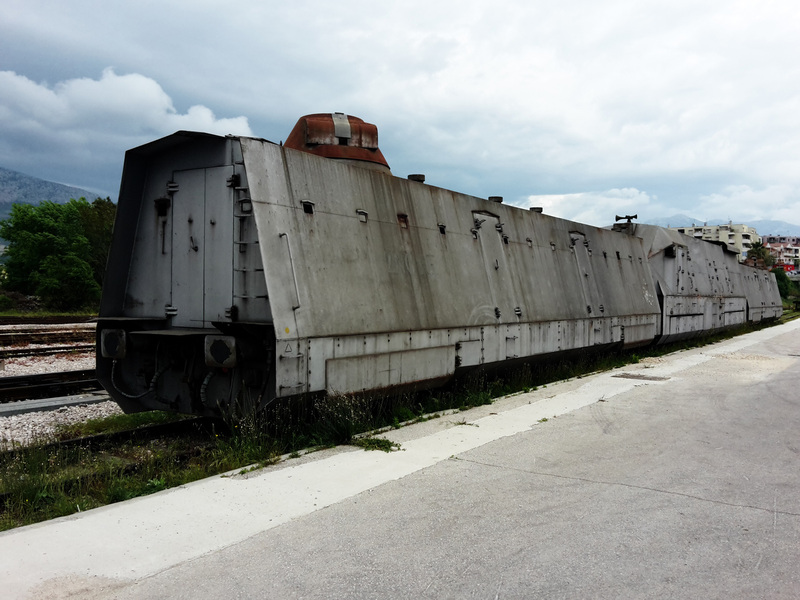 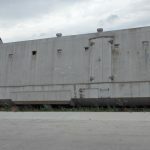 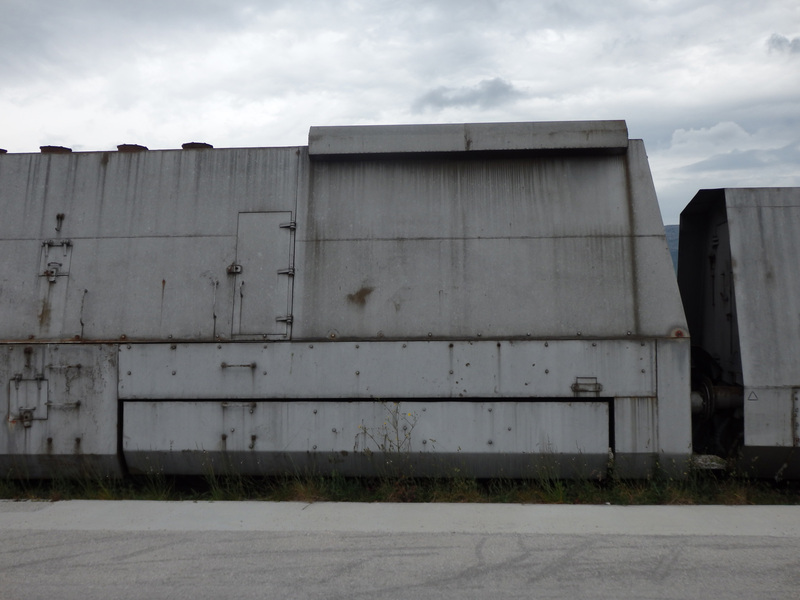 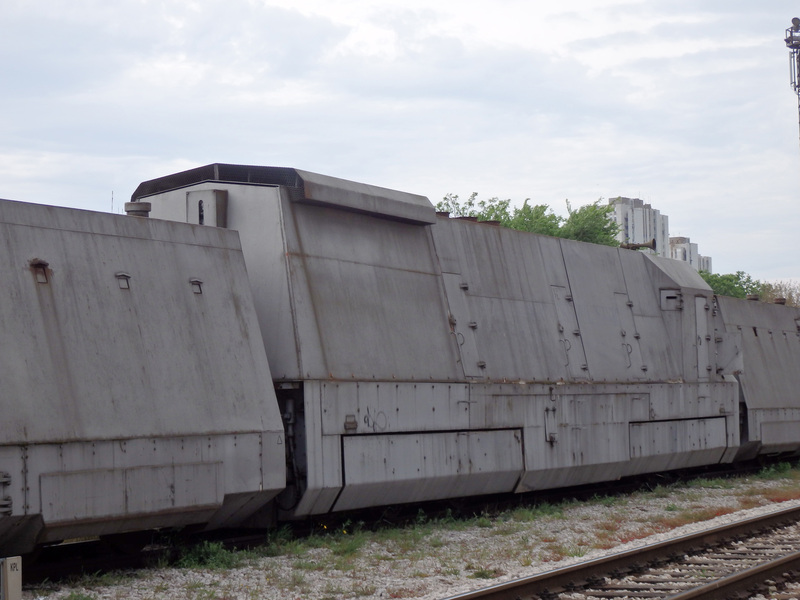 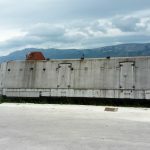 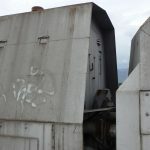 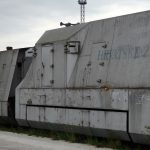 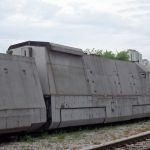 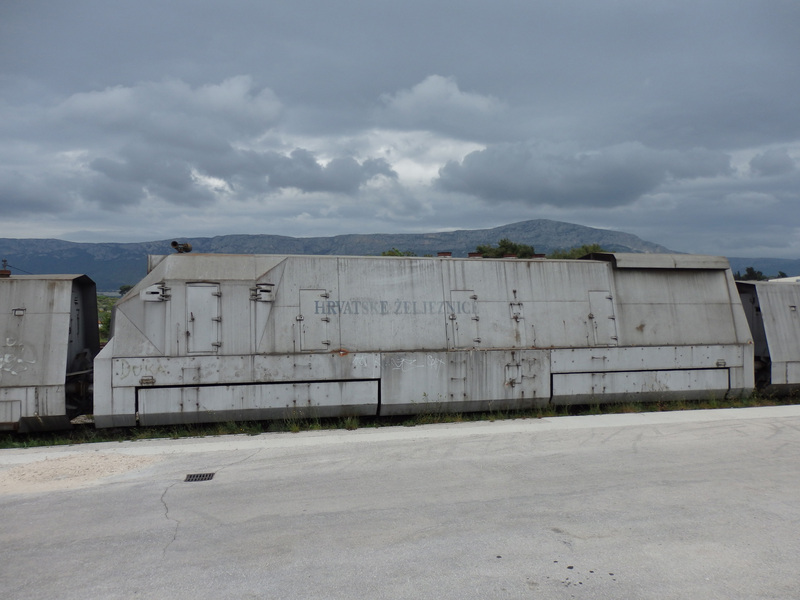 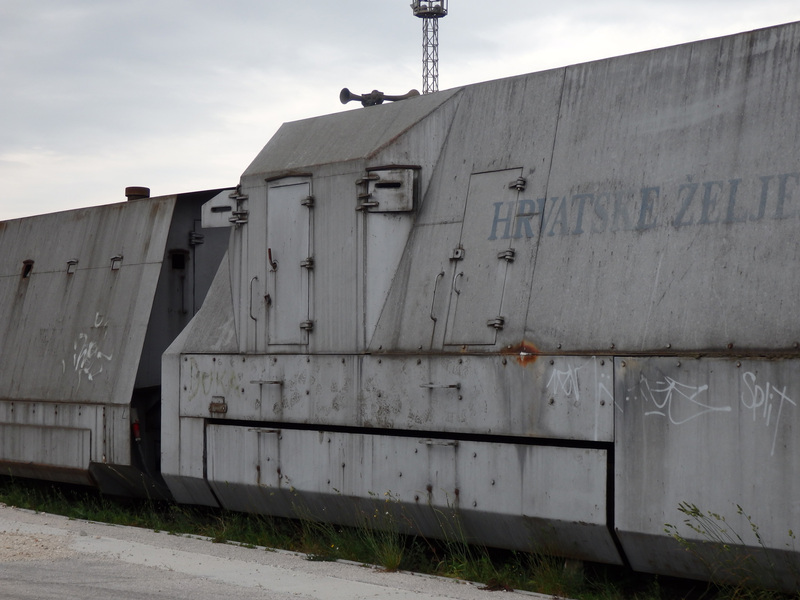 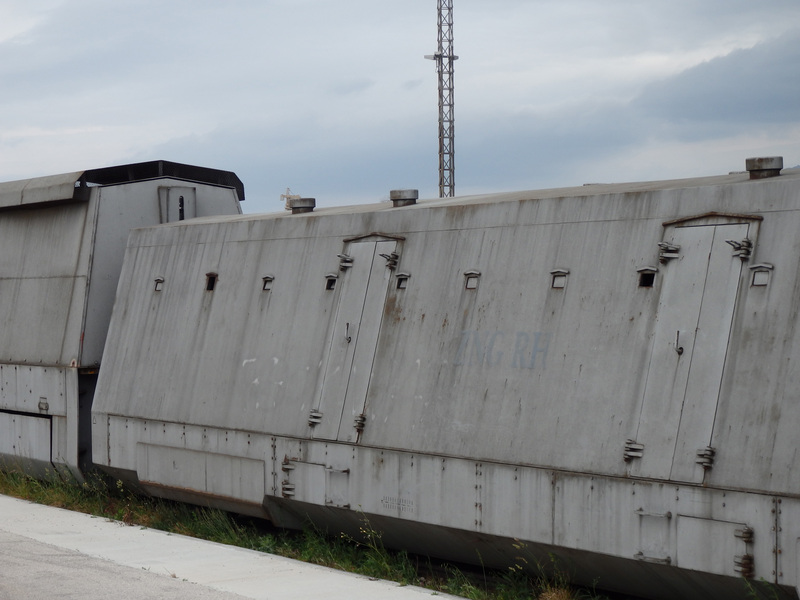 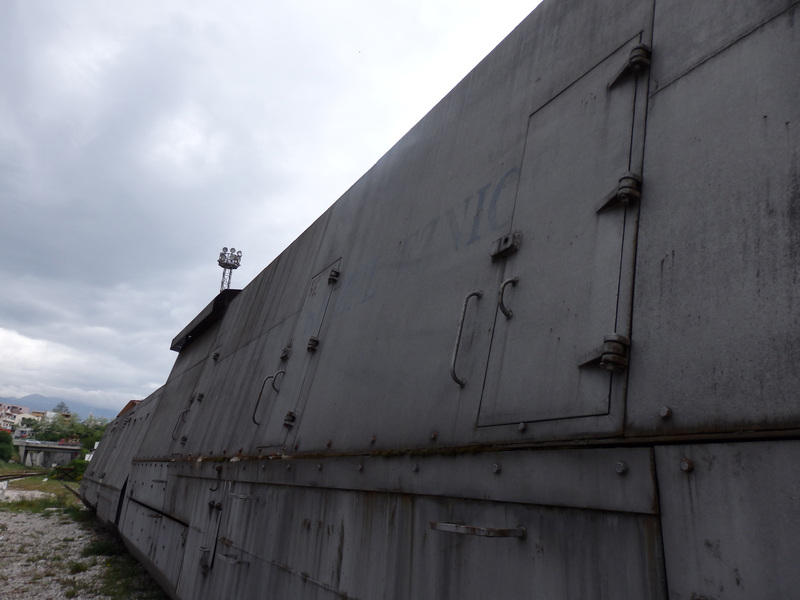 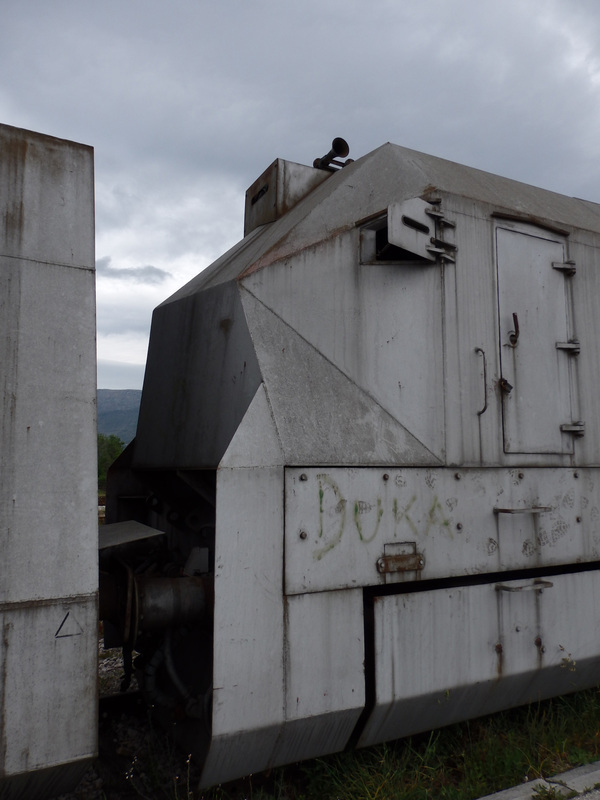 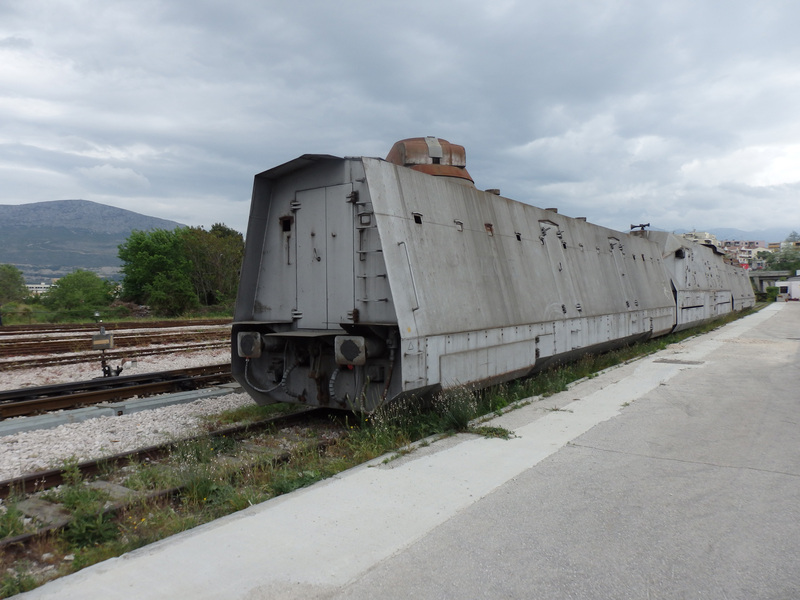 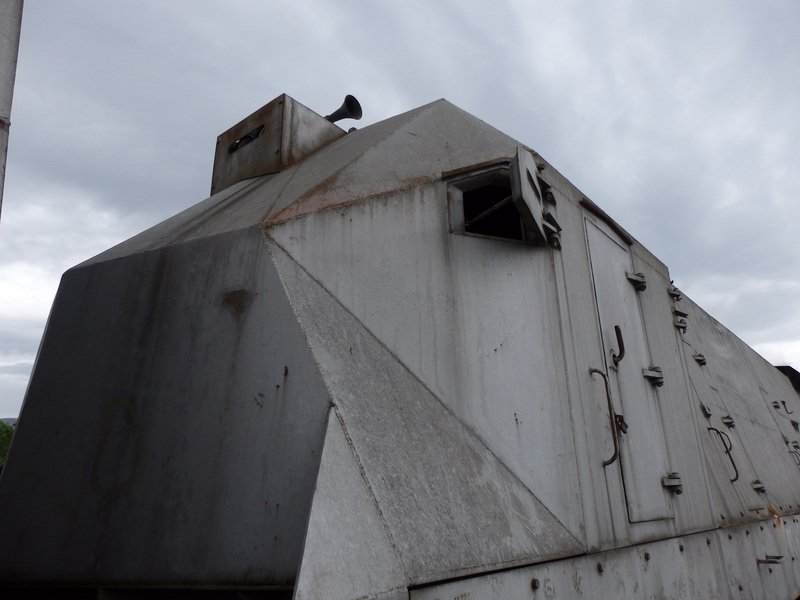 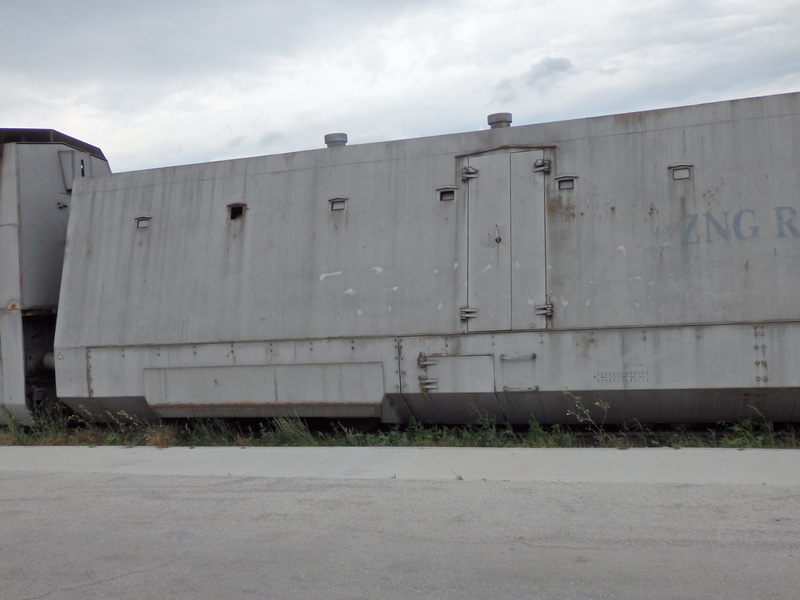 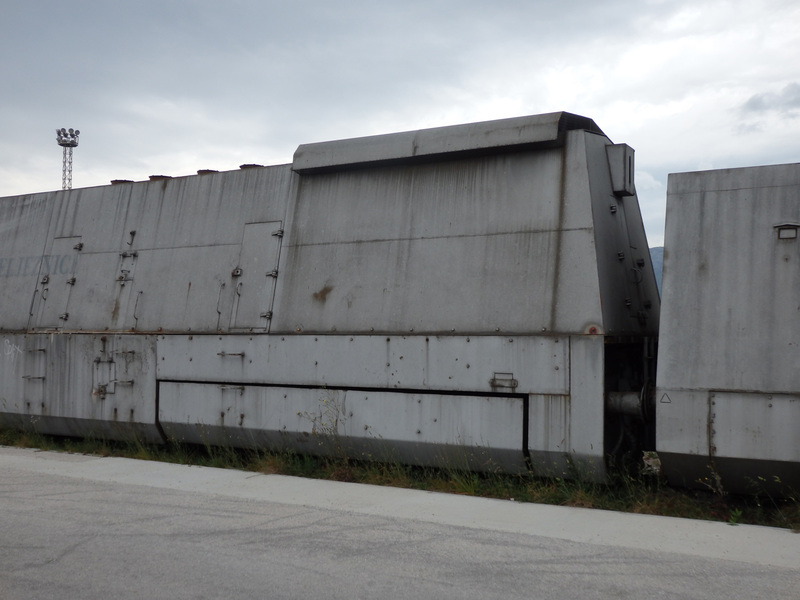 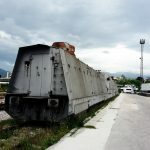 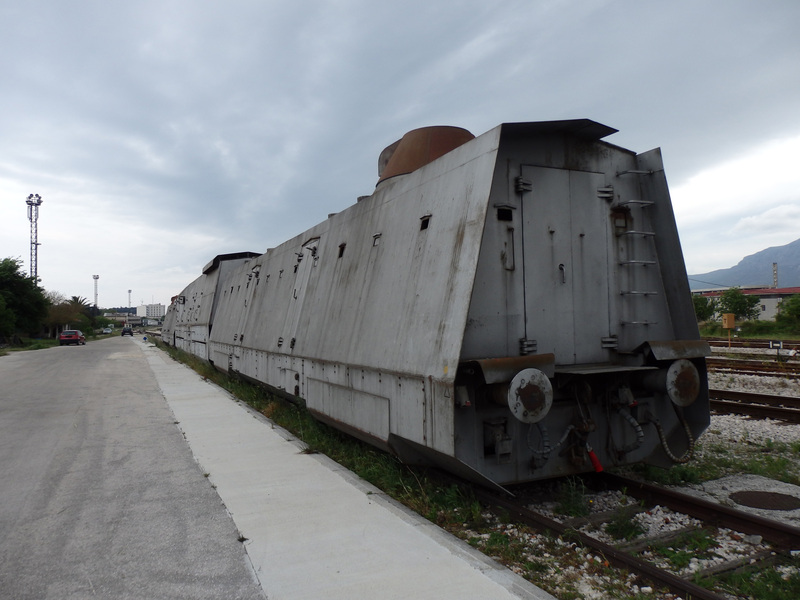 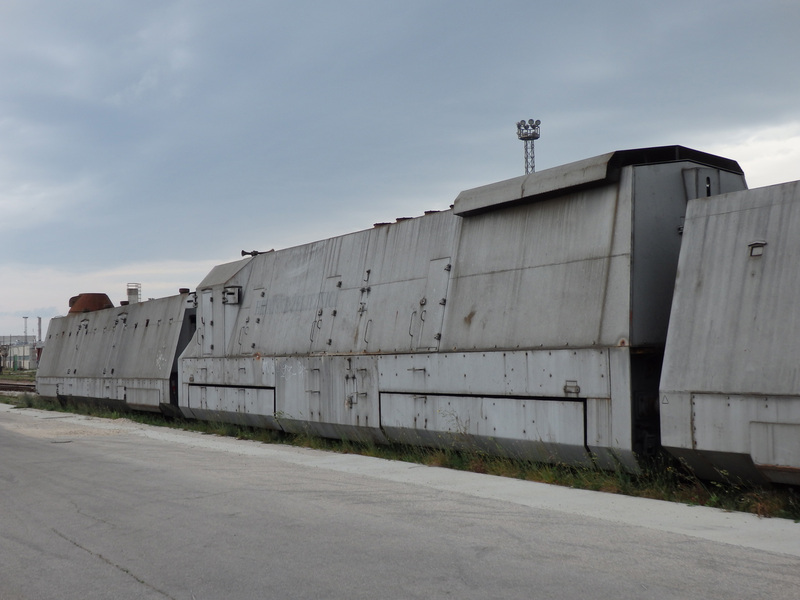 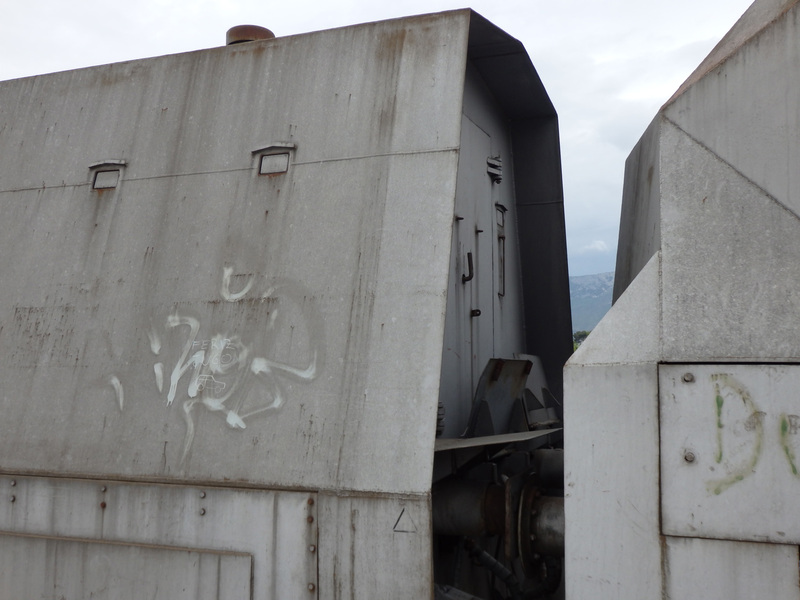 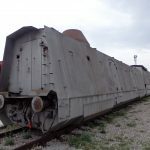 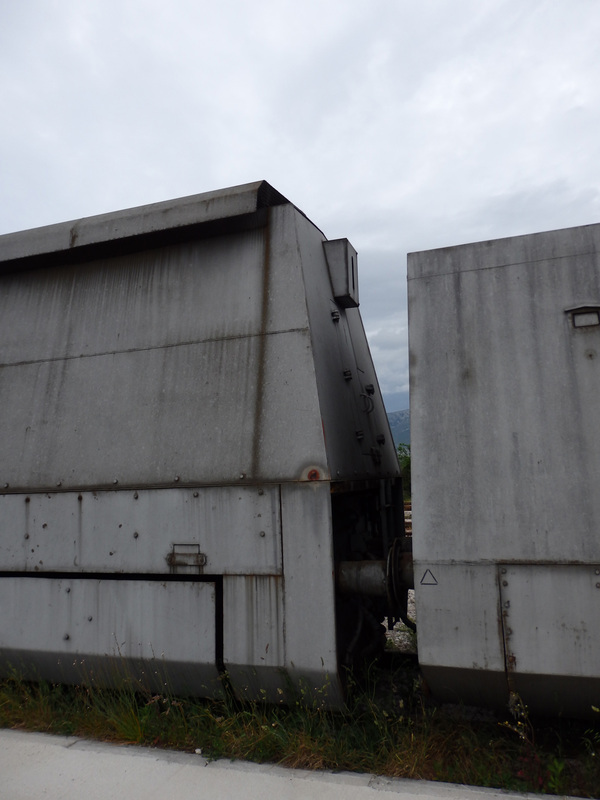 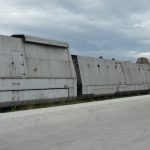 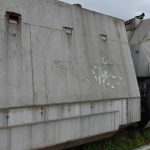 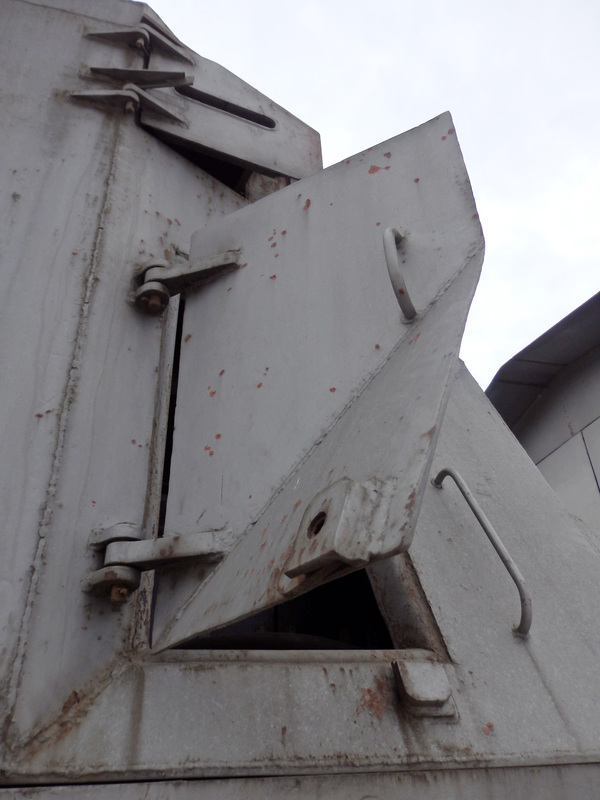 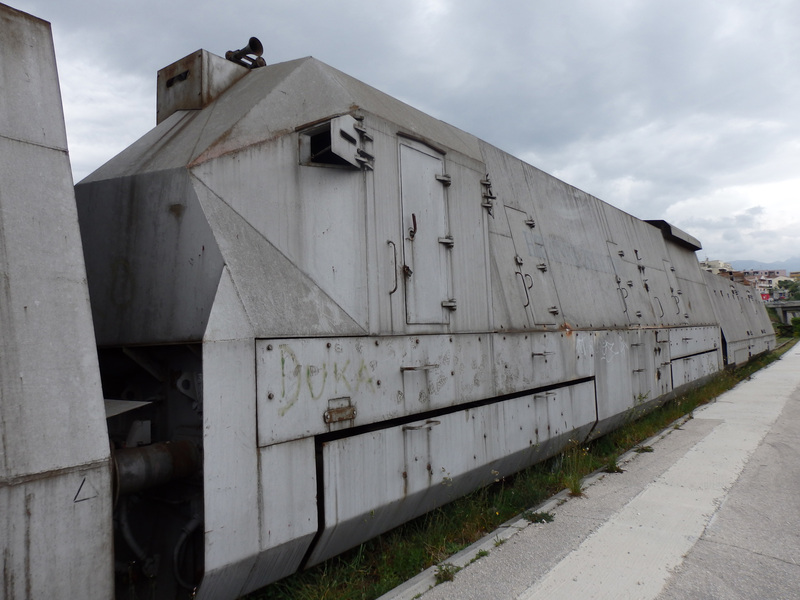 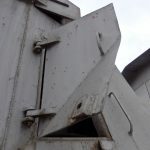 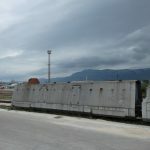 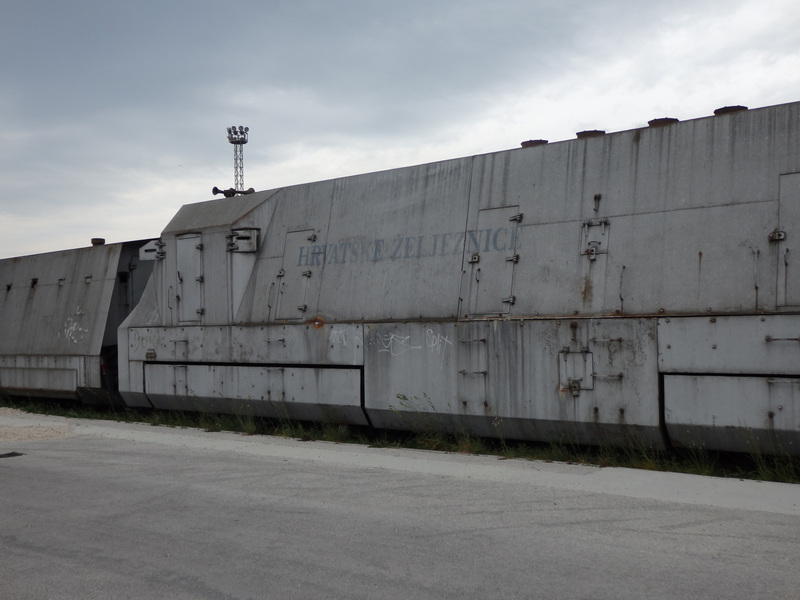 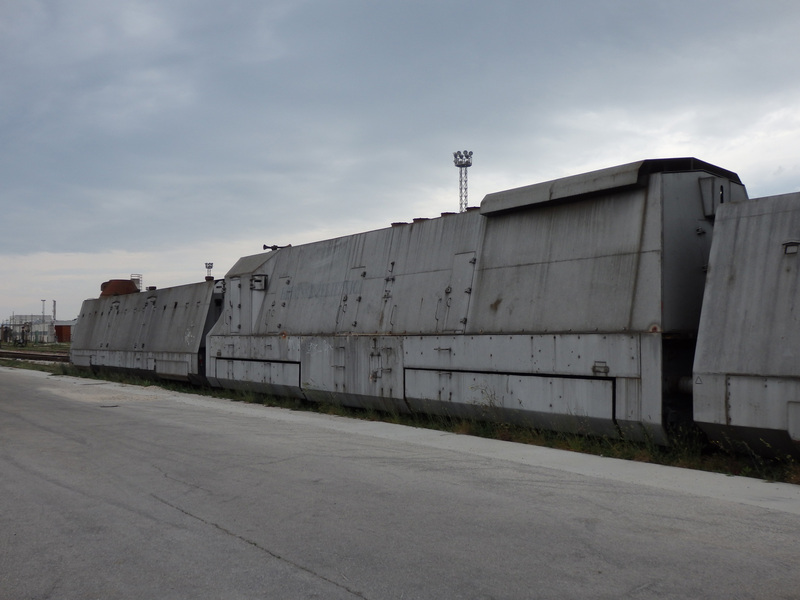 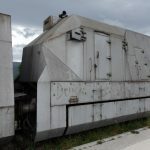 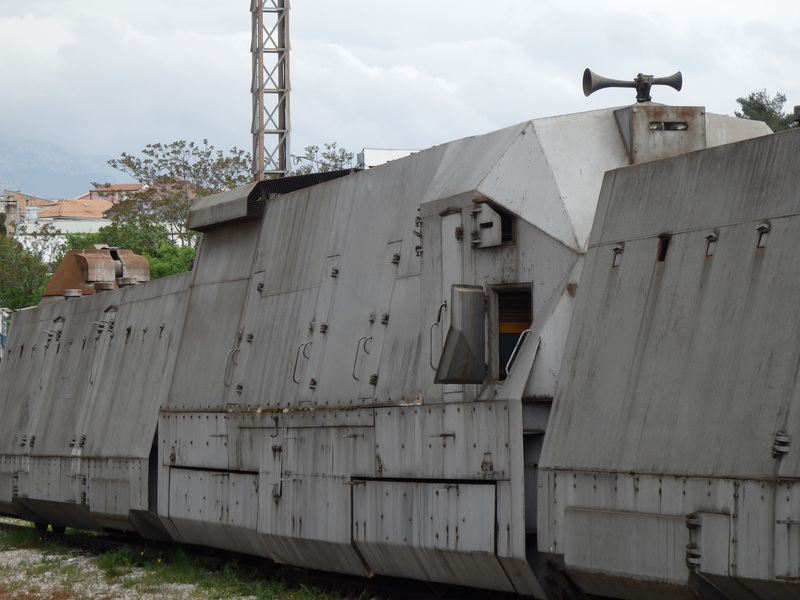 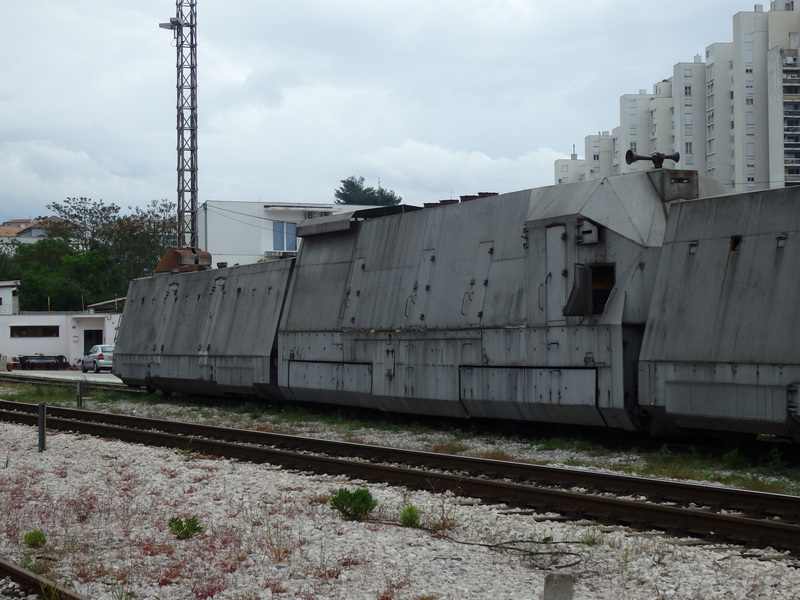 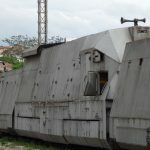 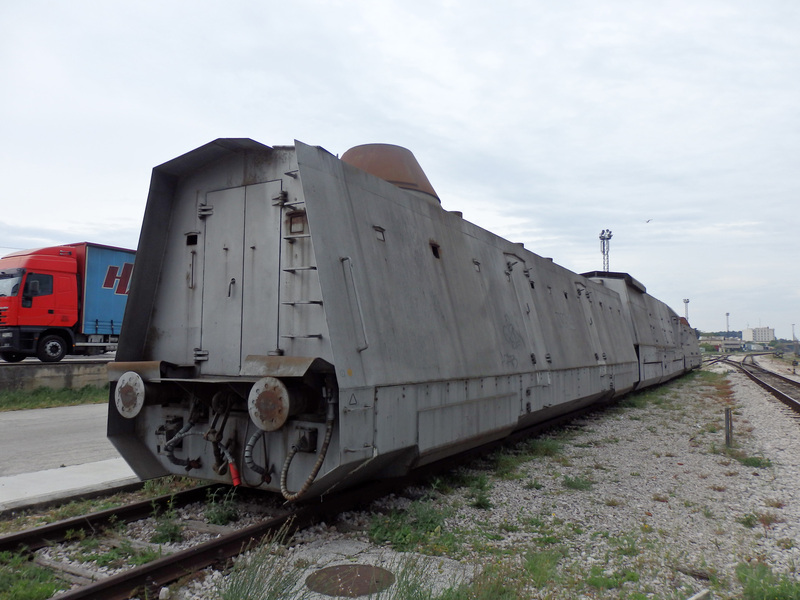 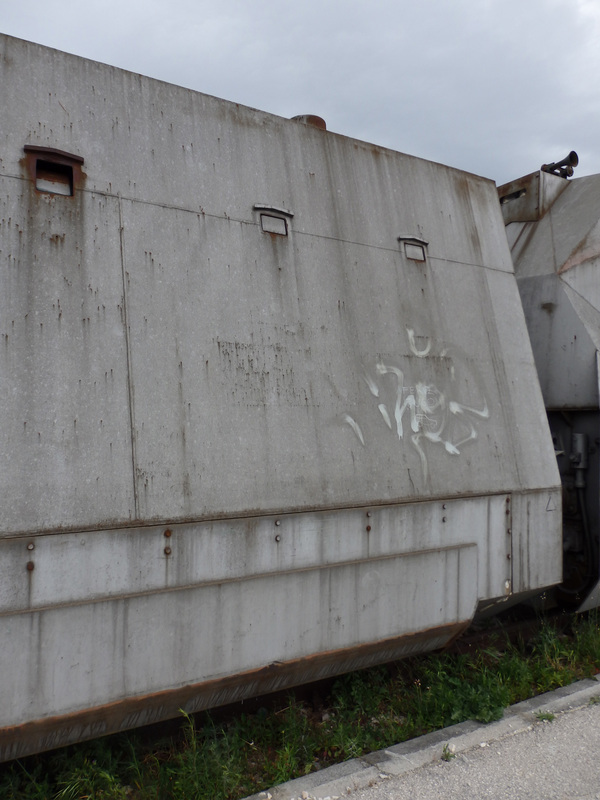 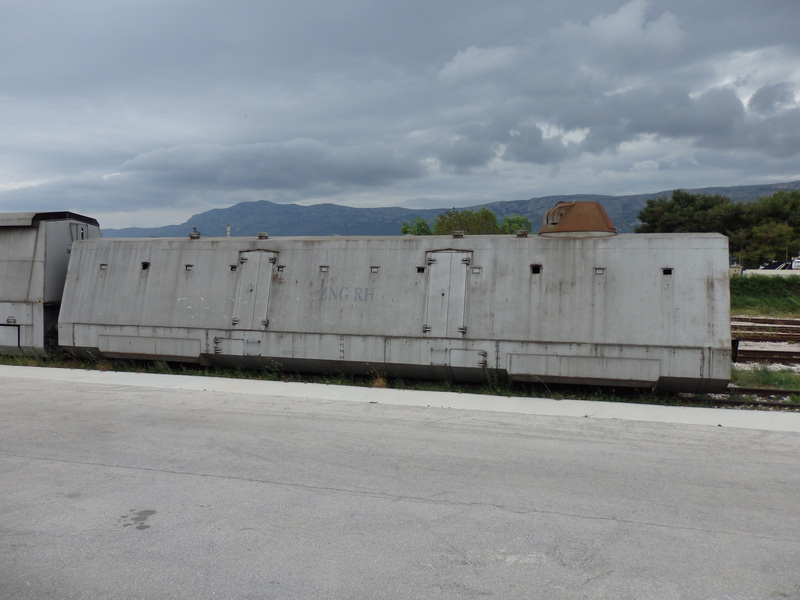 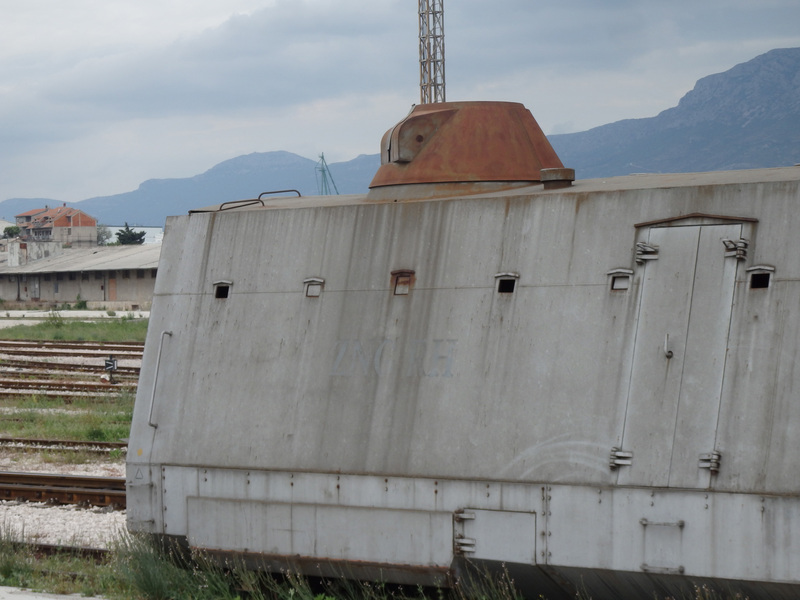 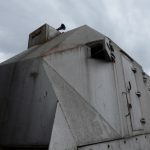 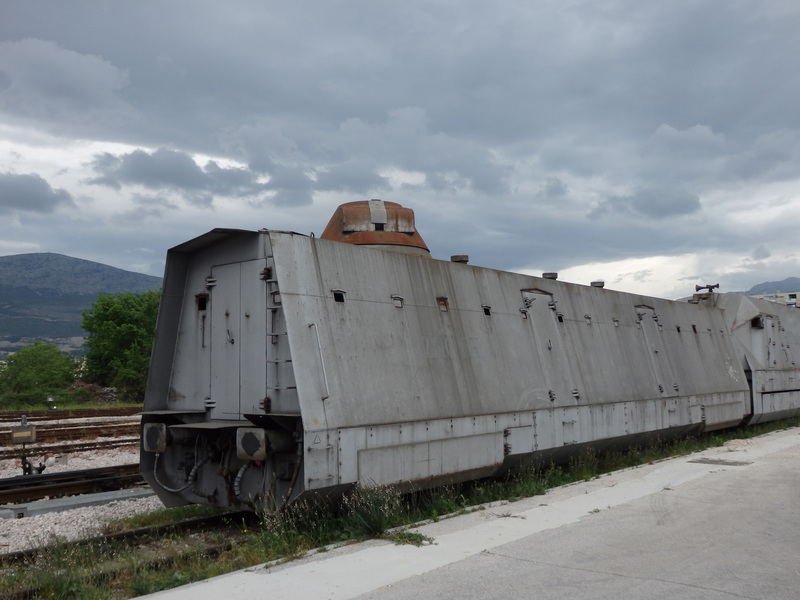 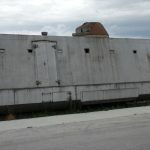 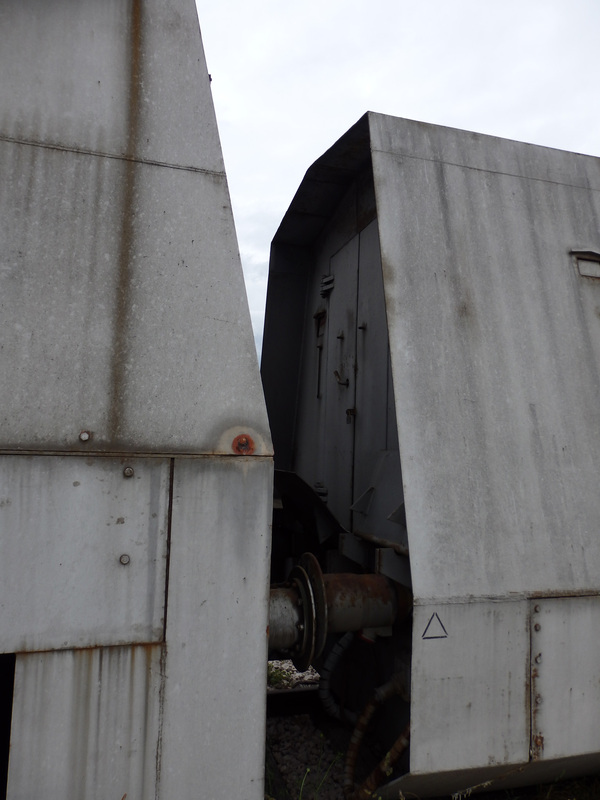 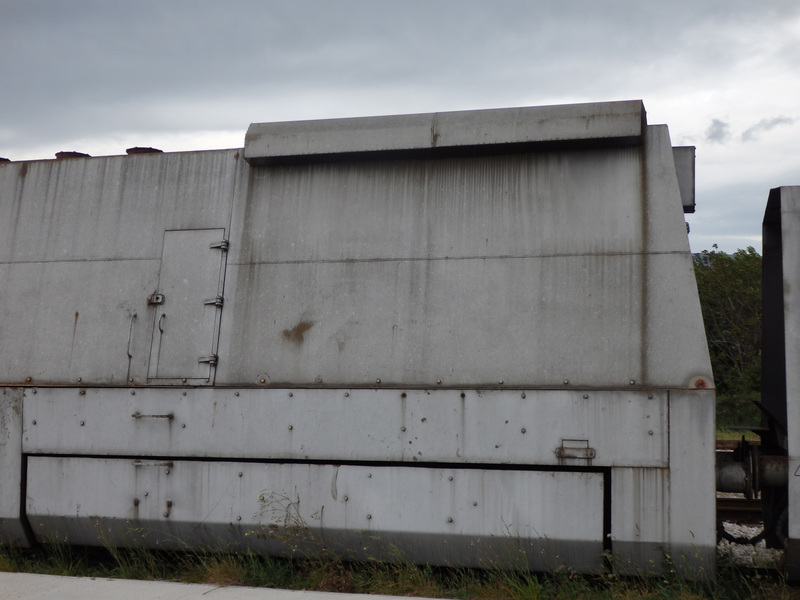 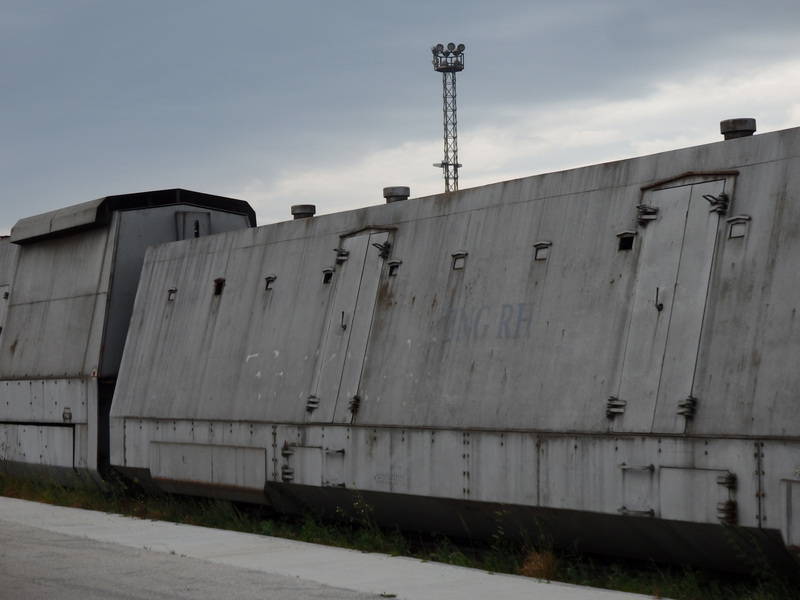 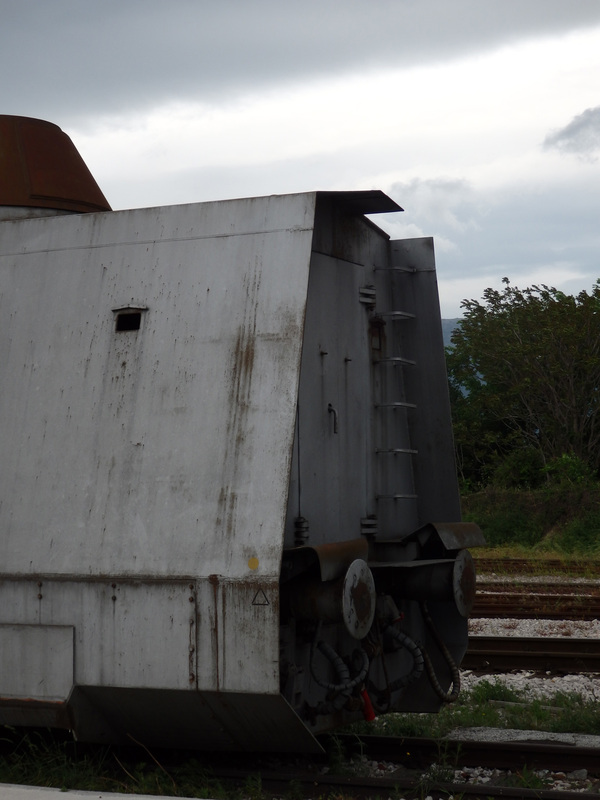 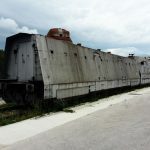 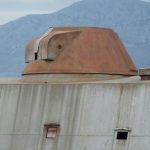 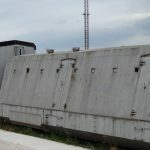 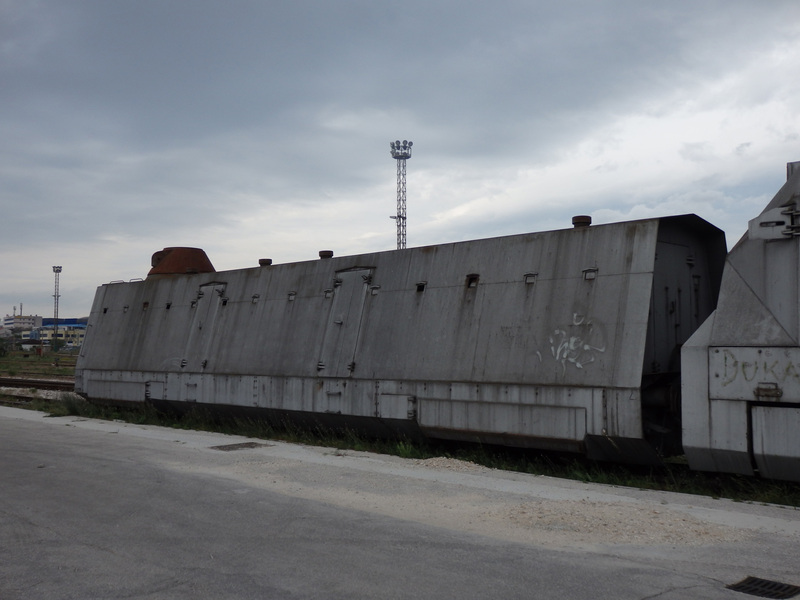 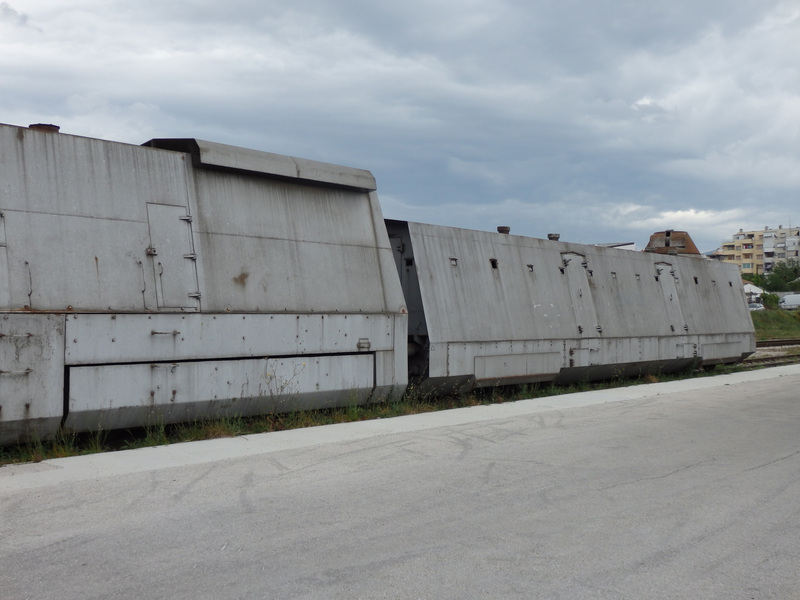 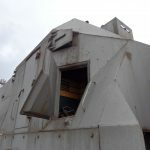 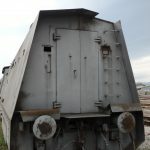 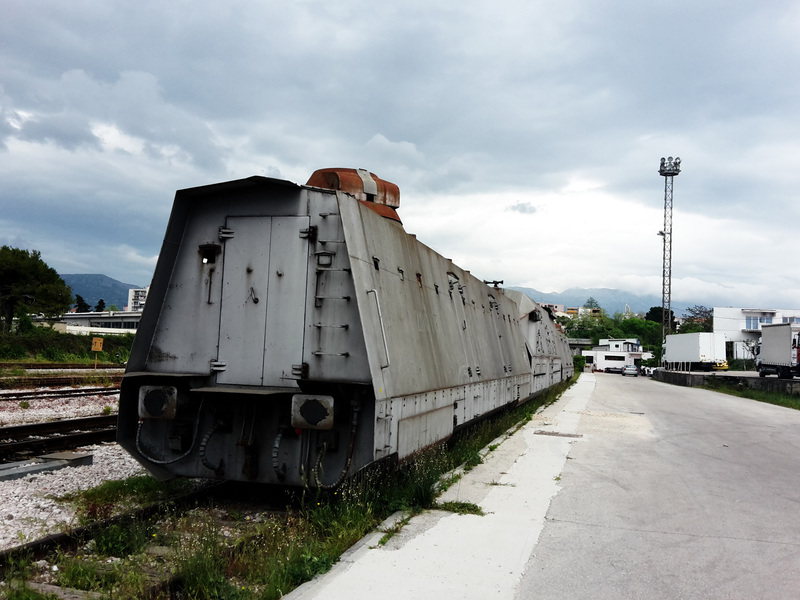 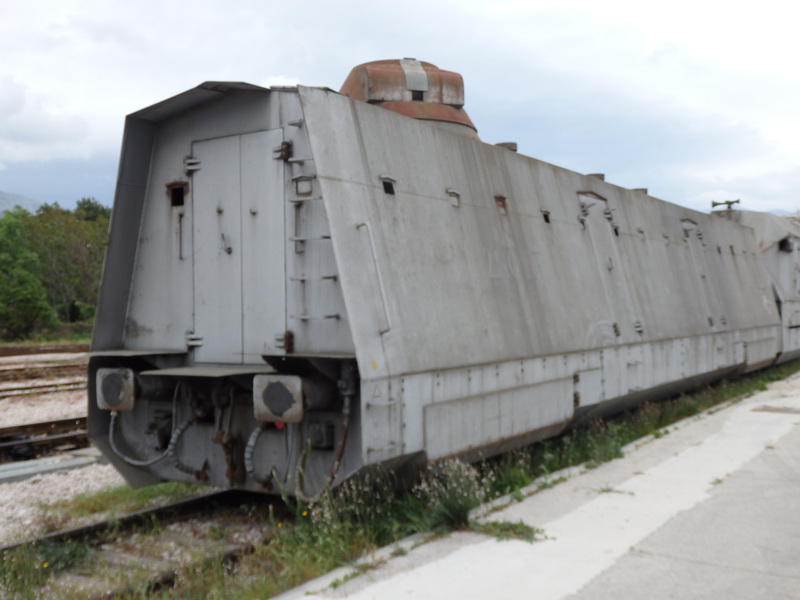 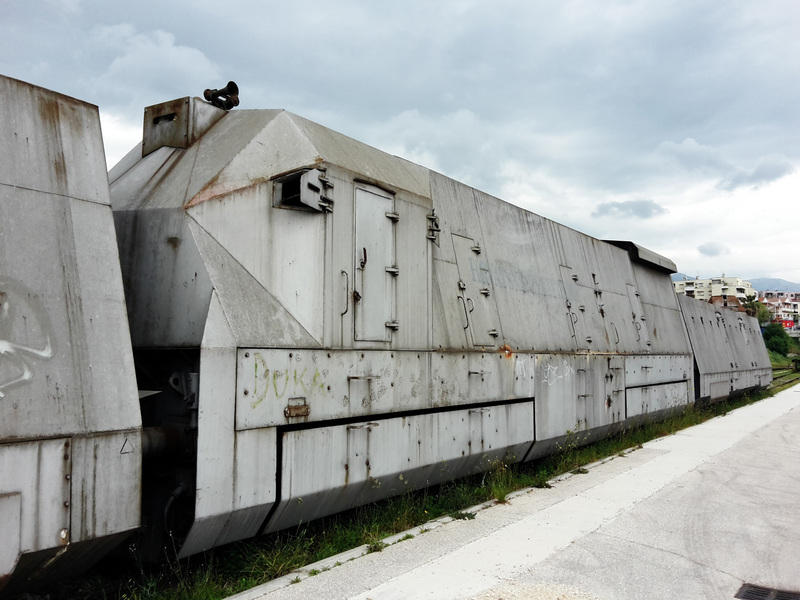 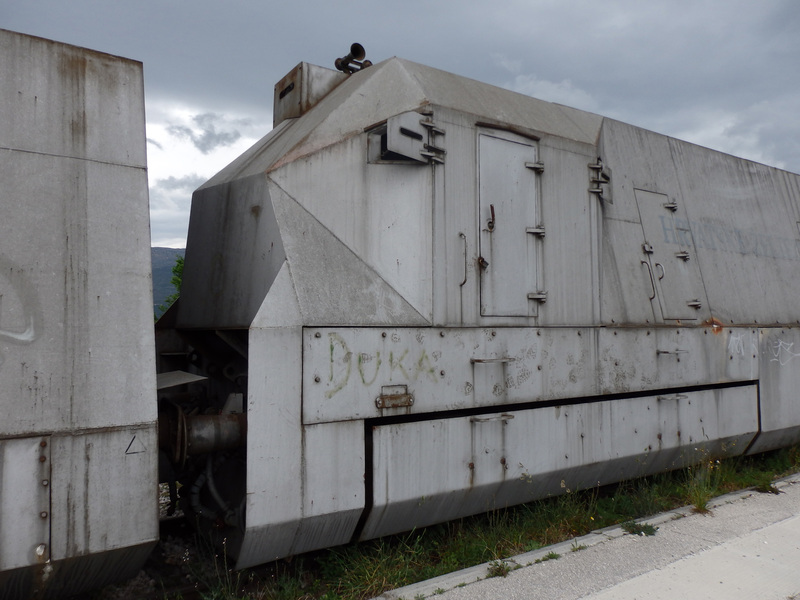 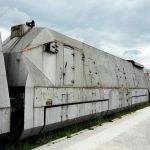 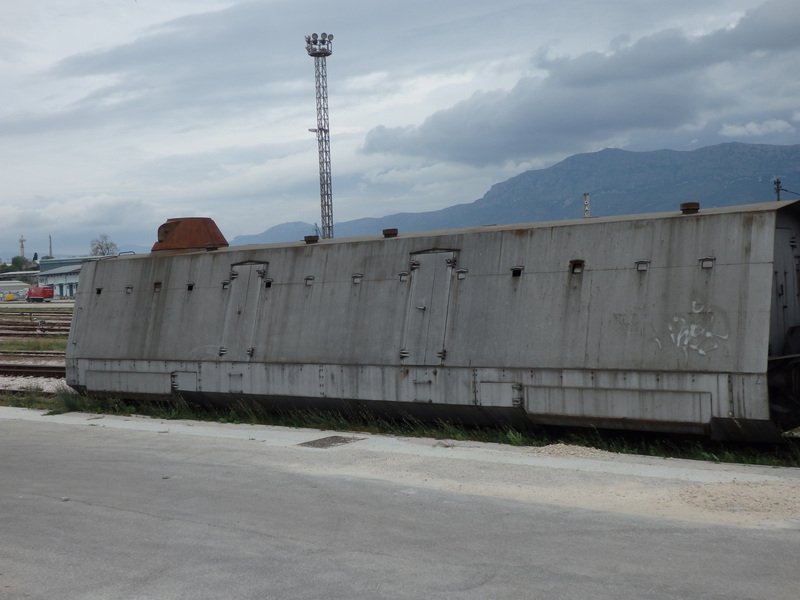 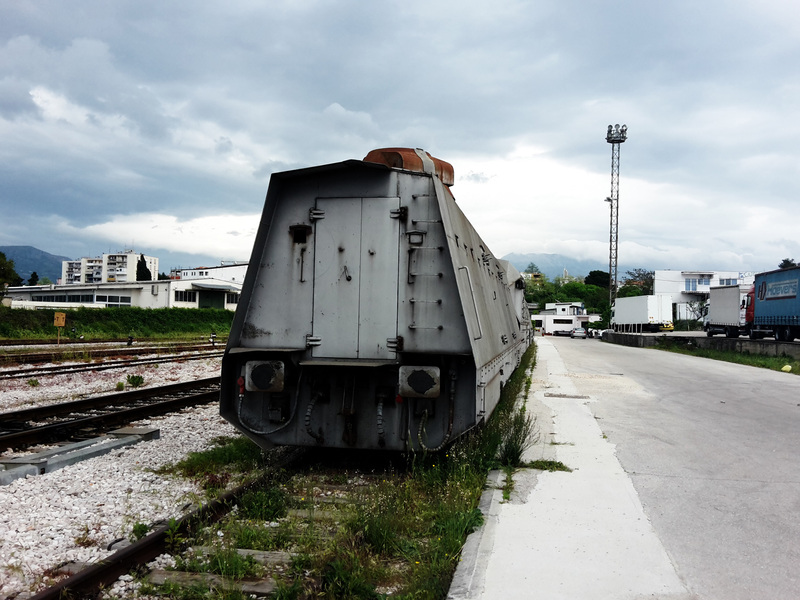 In 2006 the Croatian Railway Museum loaned the armoured train to Brodosplit for exhibiting. 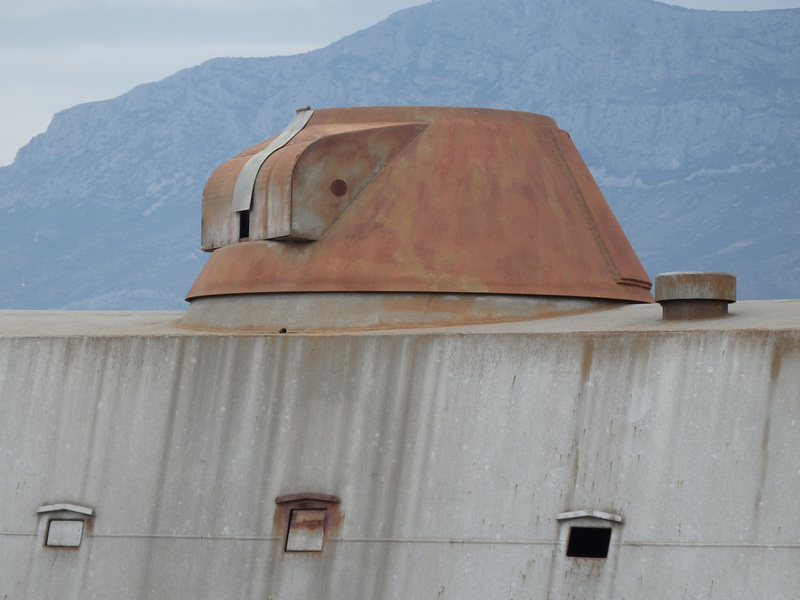 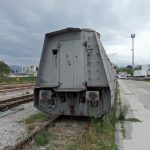 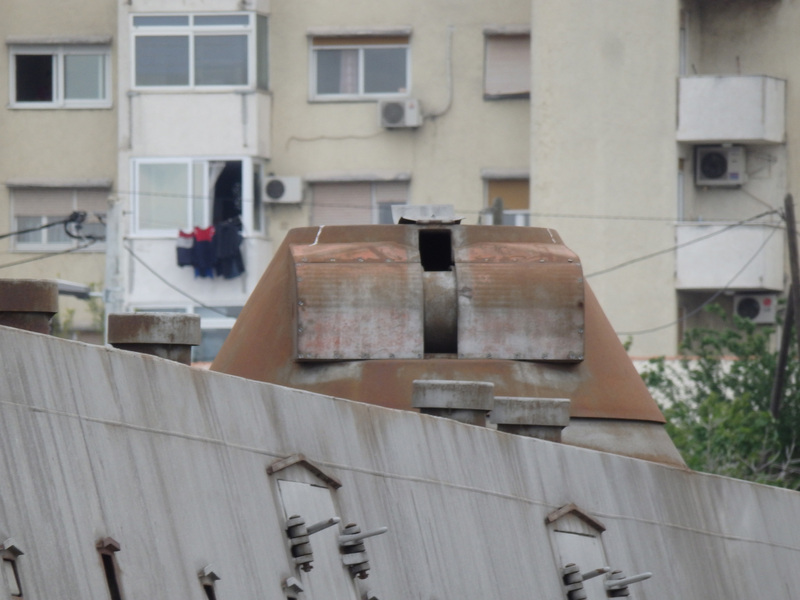 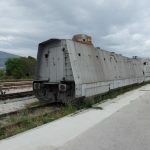 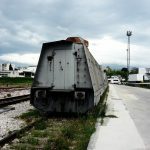 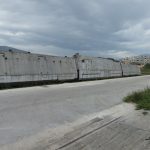 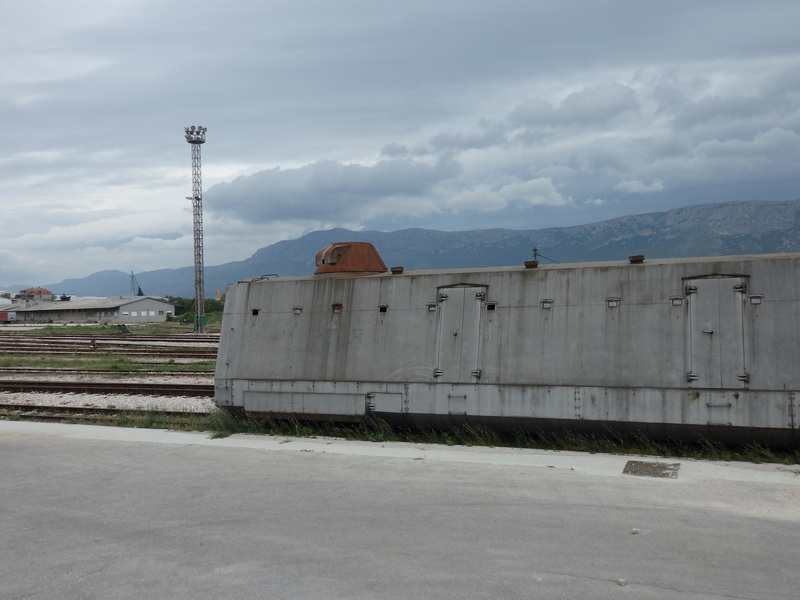 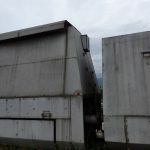 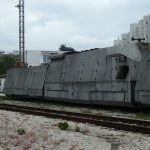 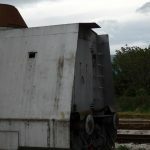 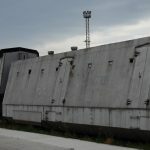 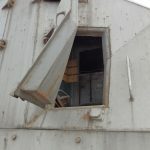 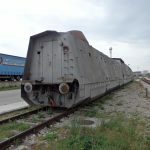 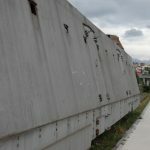 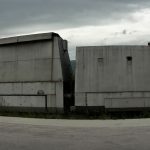 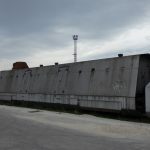 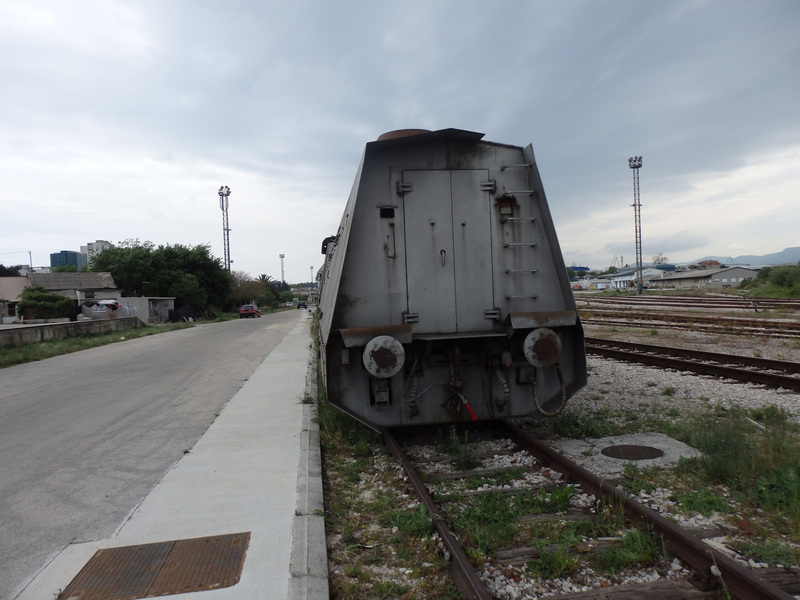 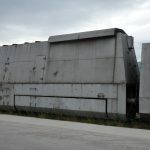 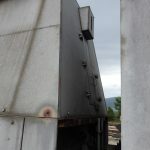 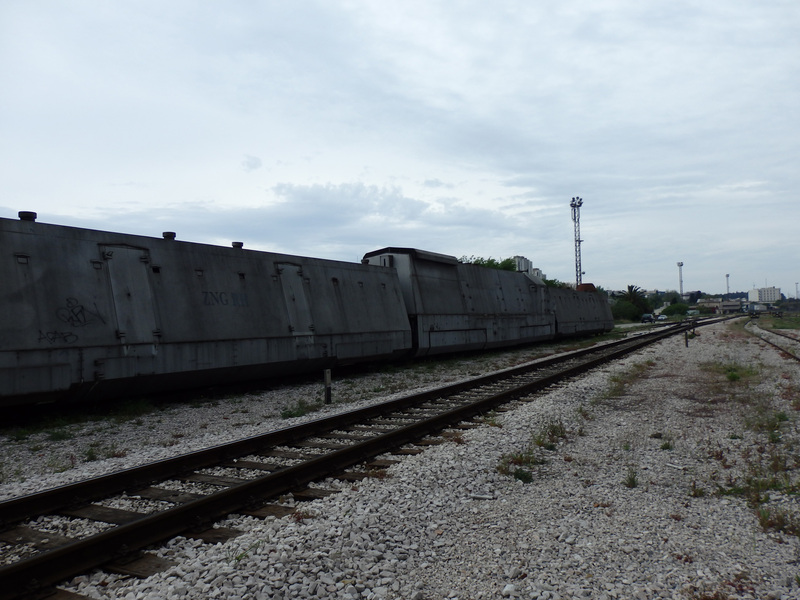 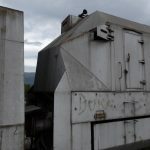 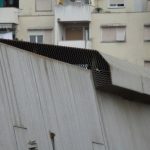 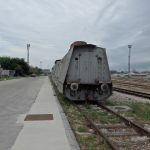 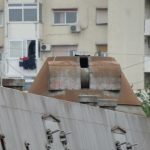 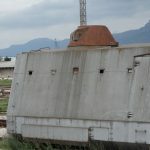 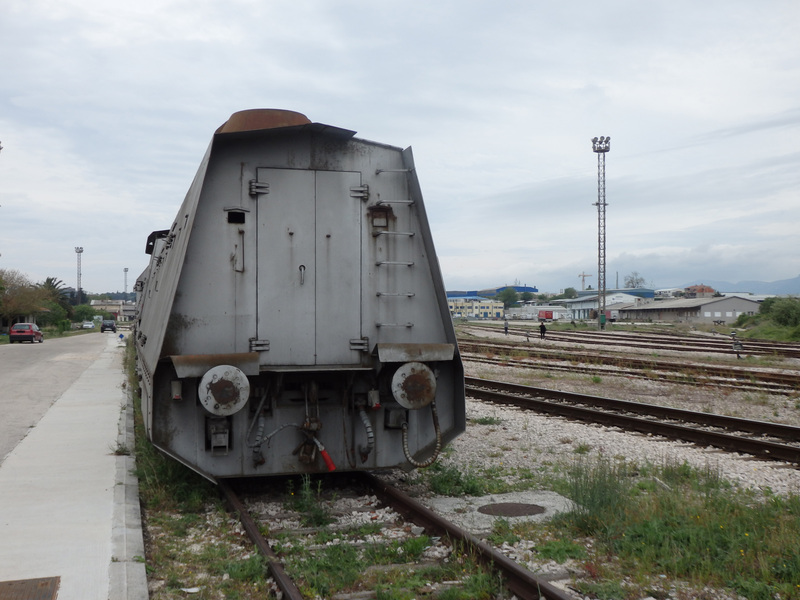 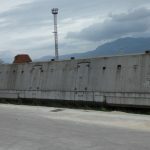 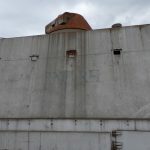 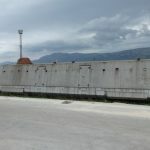 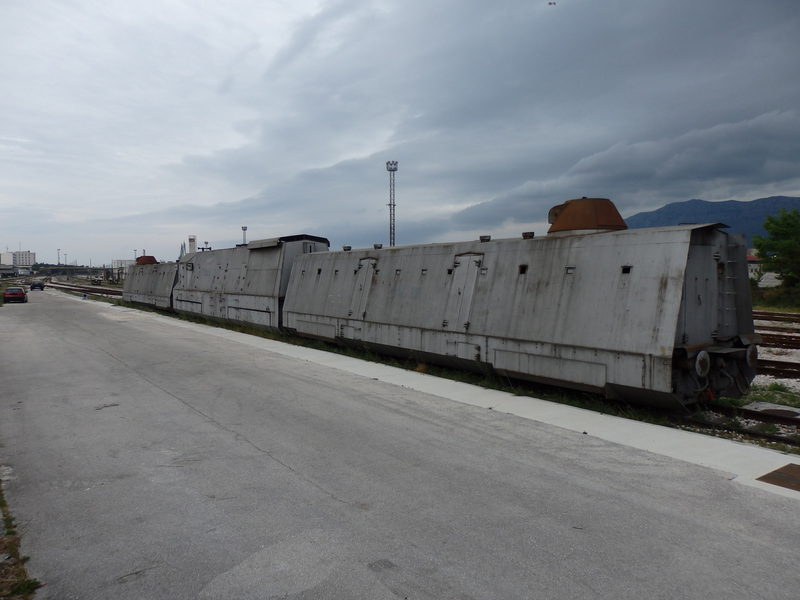 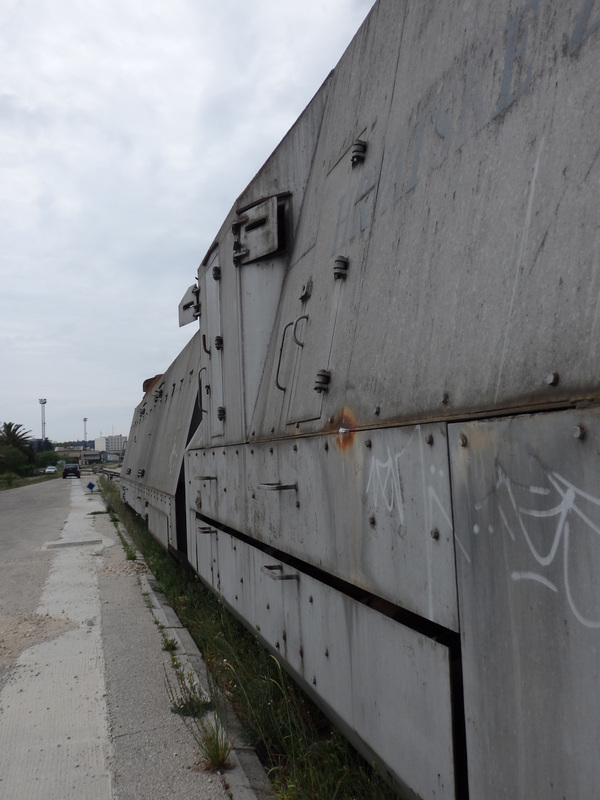 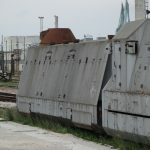 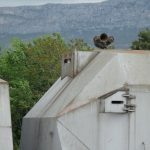 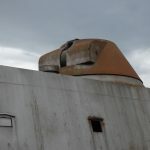 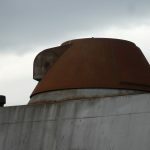 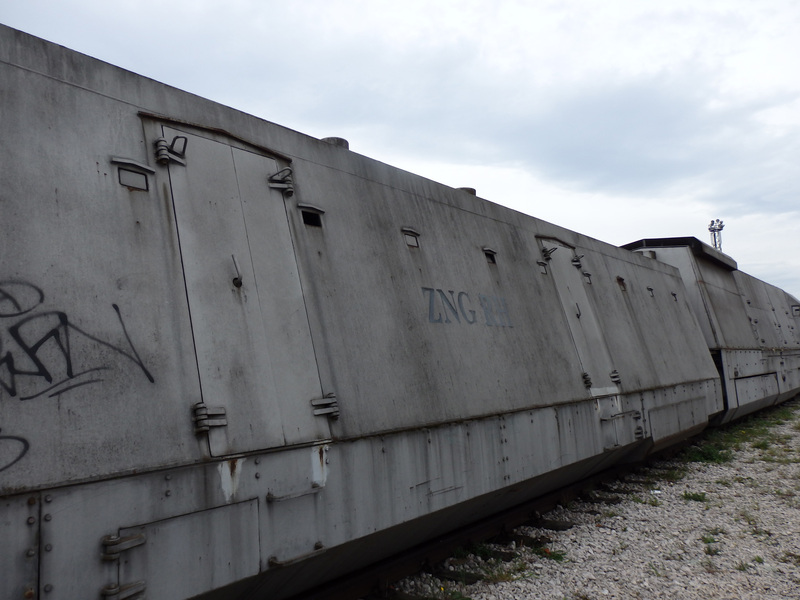 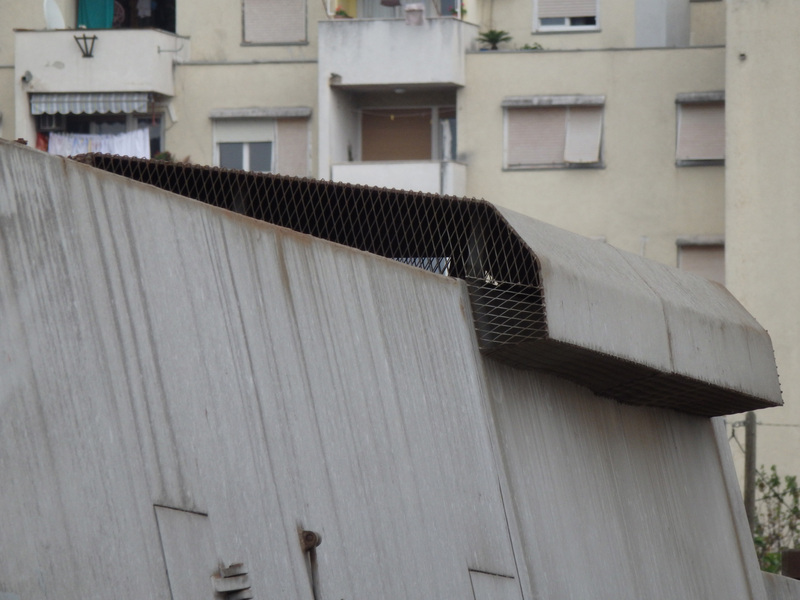 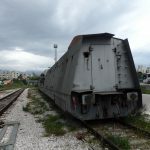 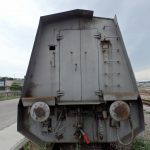 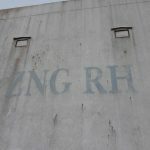 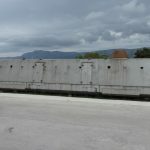 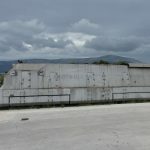 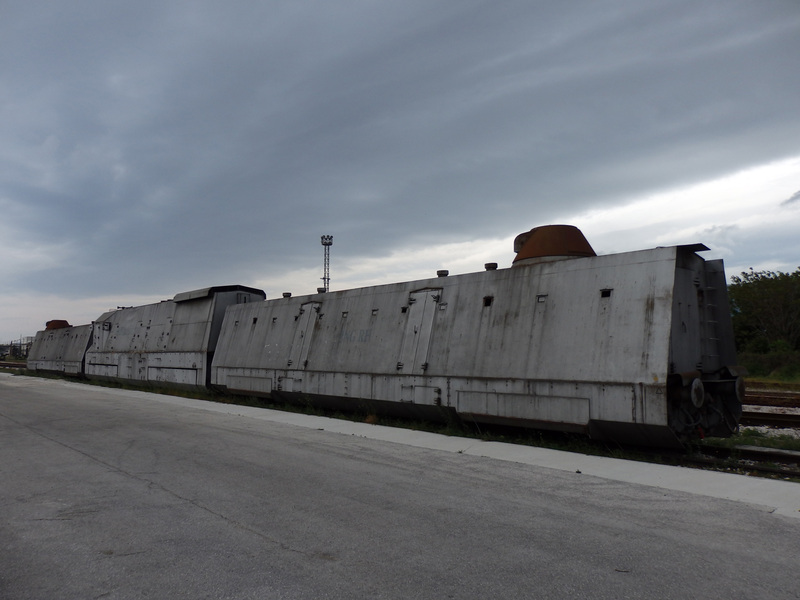 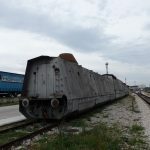 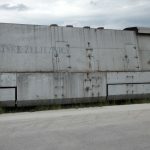 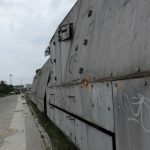 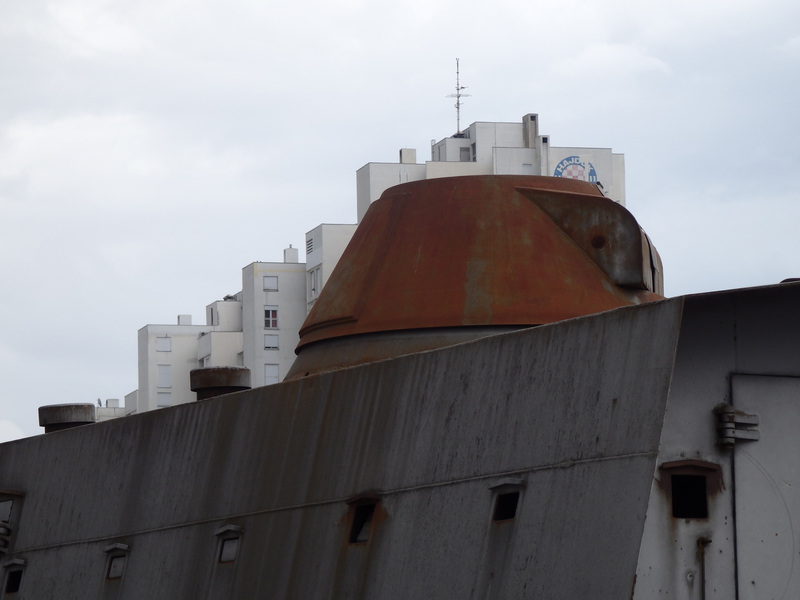 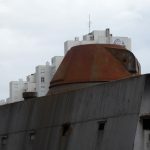 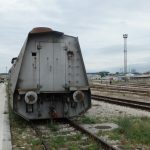 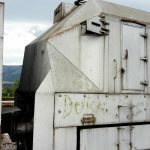 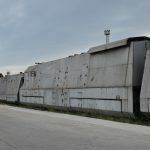 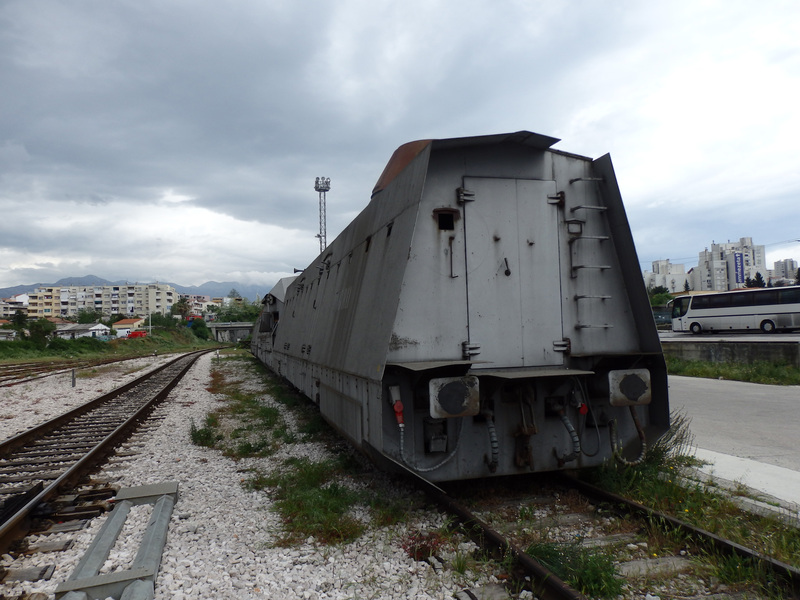 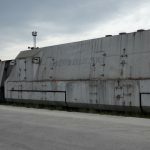 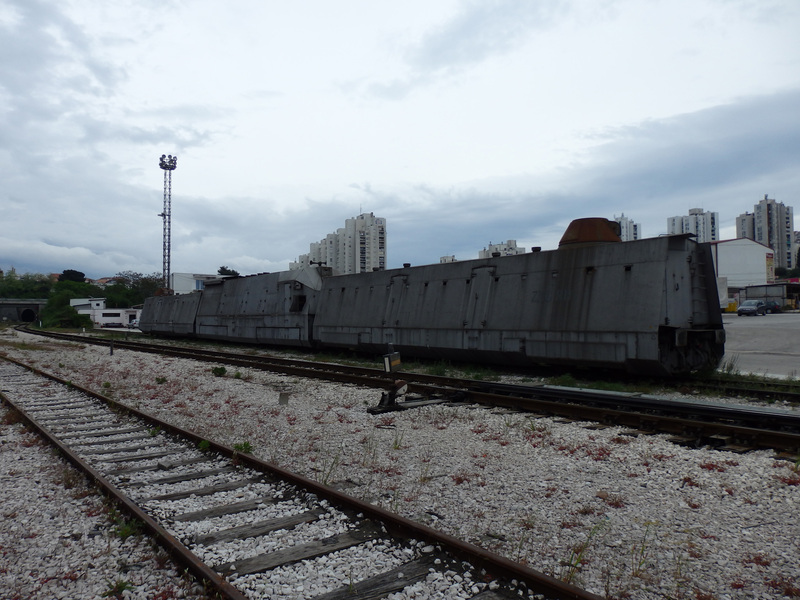 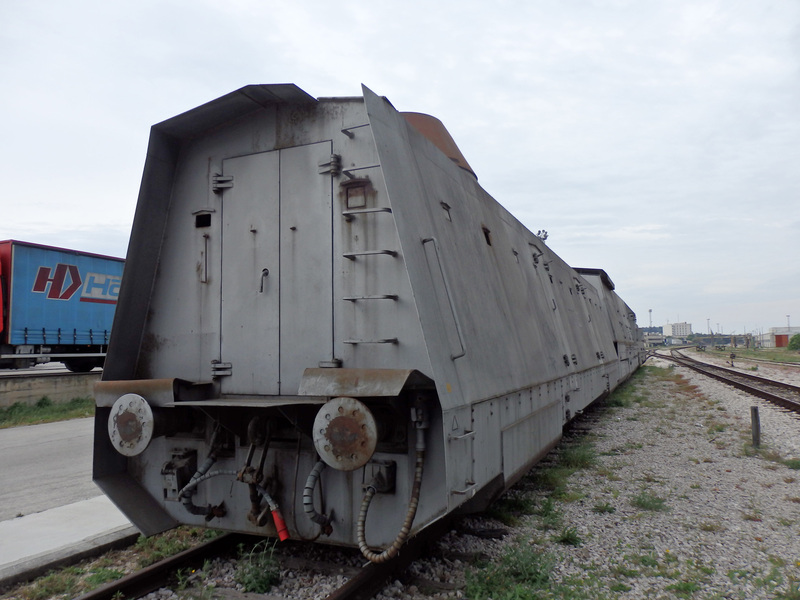 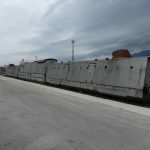 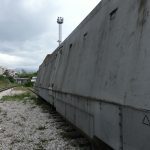 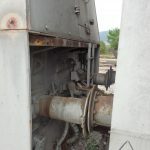 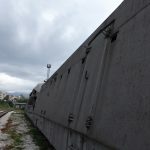 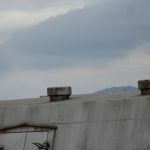 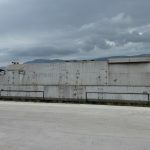 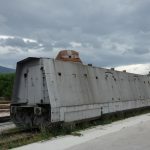 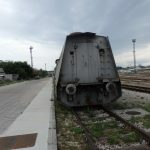 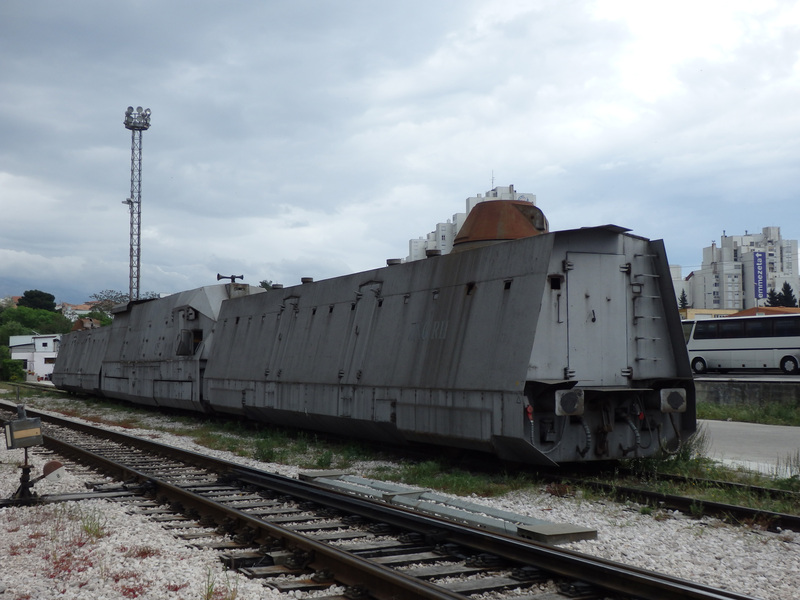 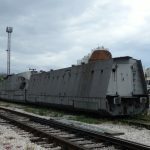 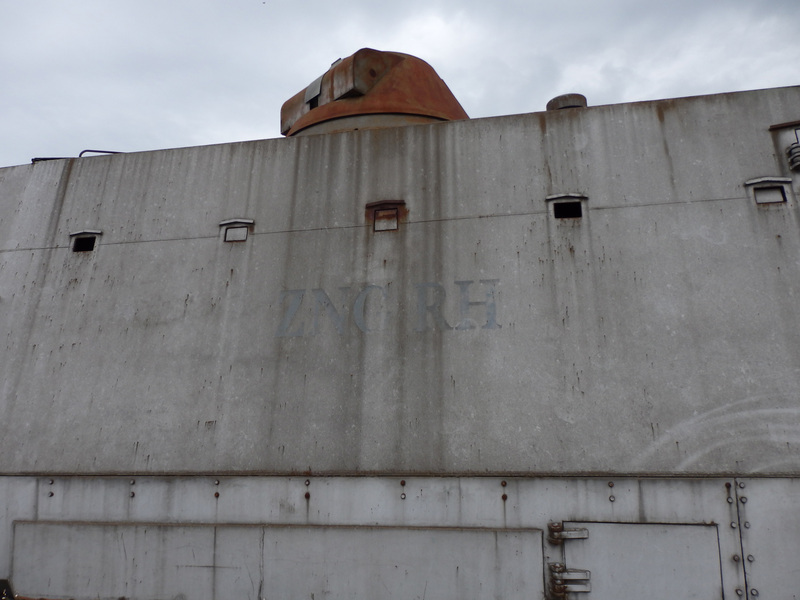 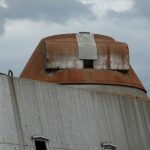 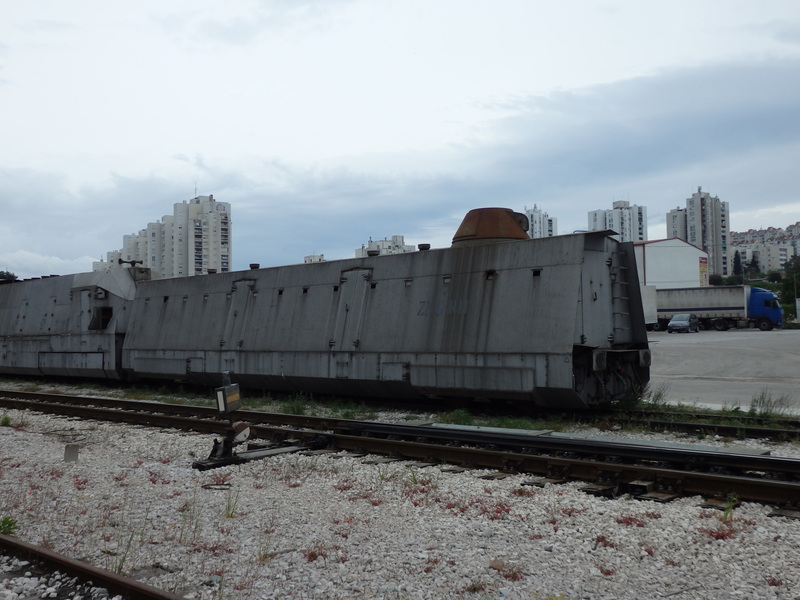 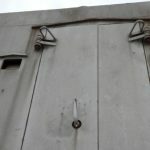 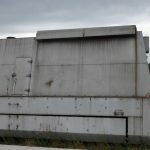 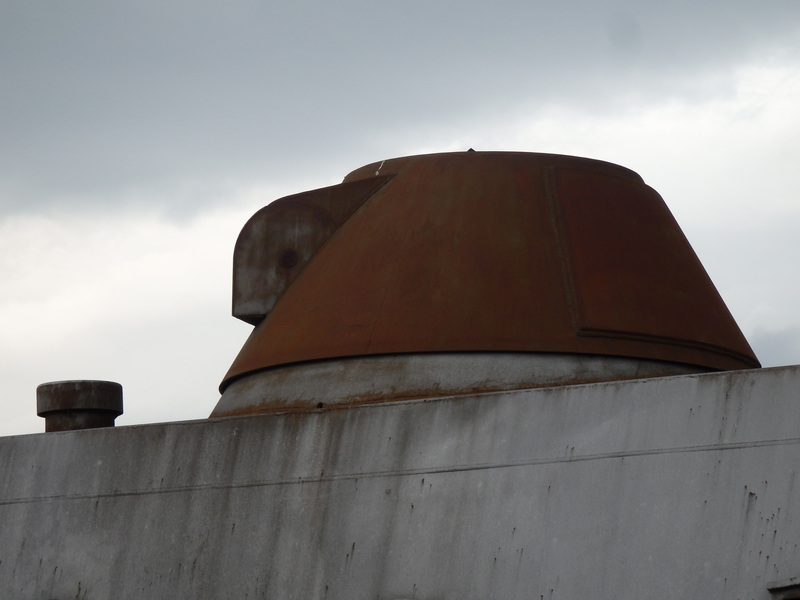 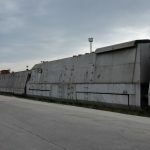 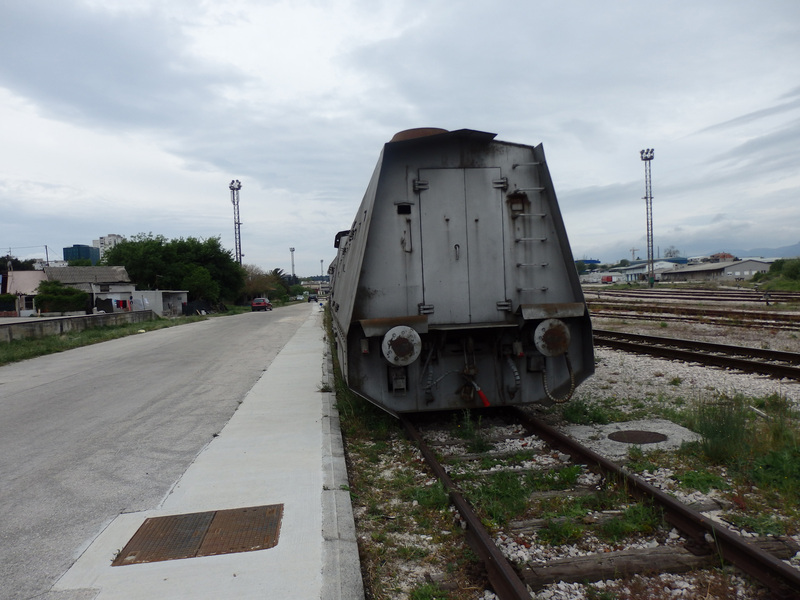 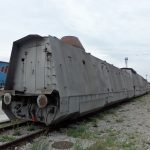 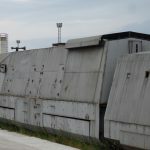 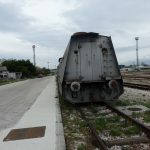 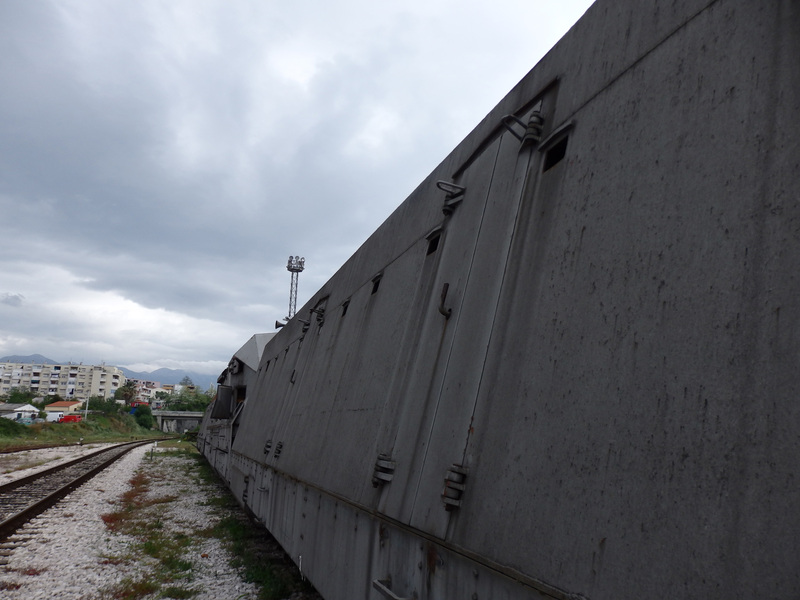 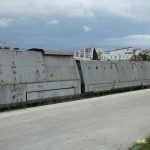 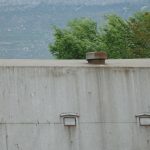 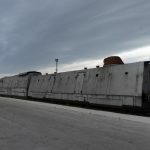 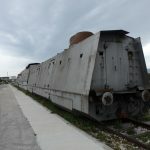 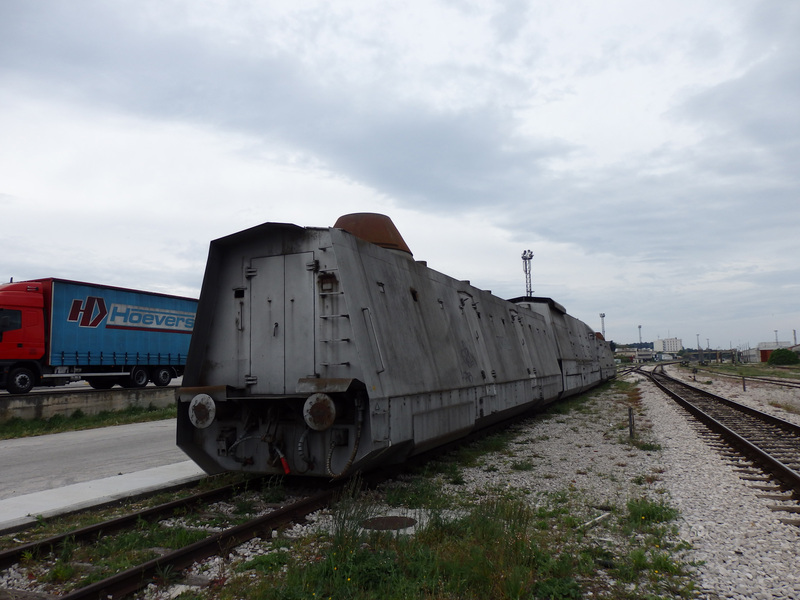 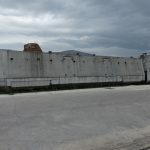 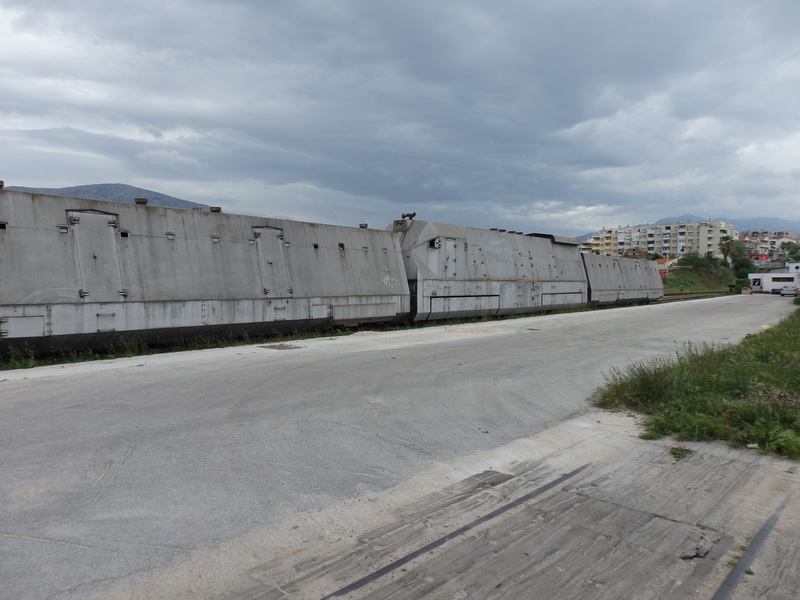 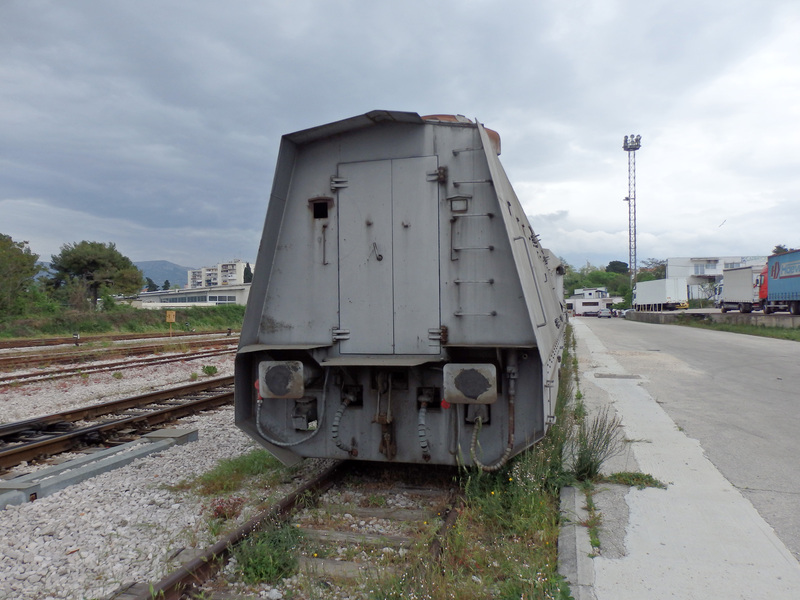 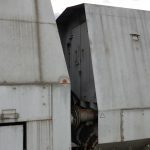 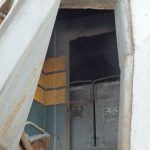 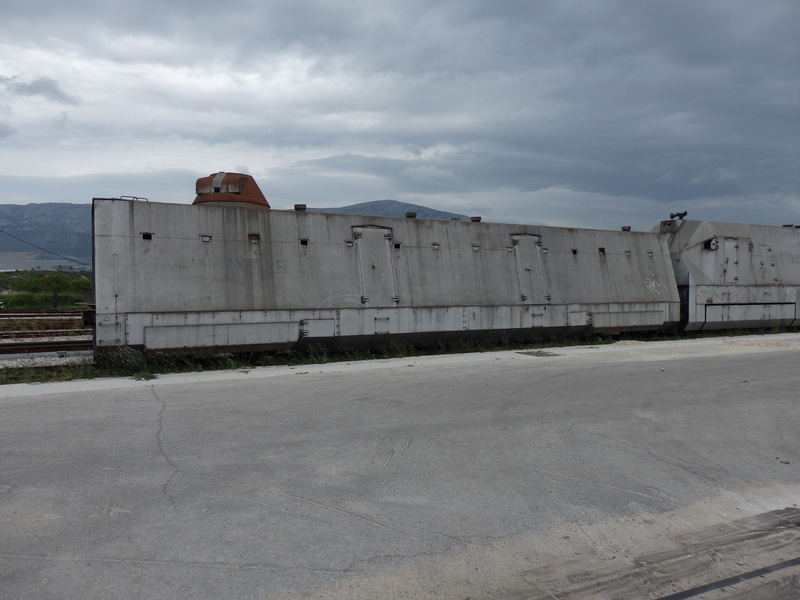 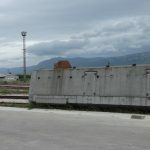 It was later moved as part of an upgrading project in the shipyard.9 As of April 2015 the train was in the railway yard at Split Predgrađe where it was freely visible by going down Hercegovačka Ul. 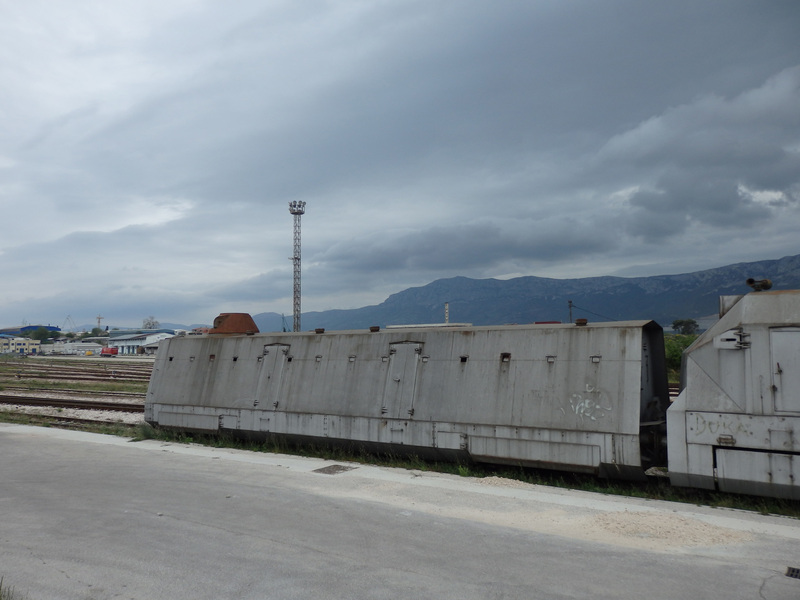 There is a station nearby and it was more-or-less walkable (albeit not a very inspiring walk) from the more touristy part of the centre. 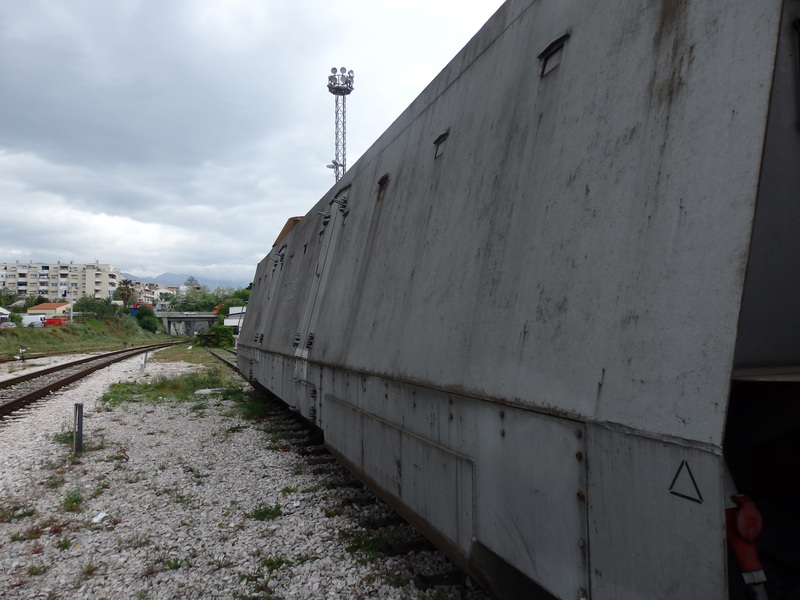 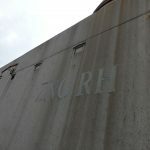 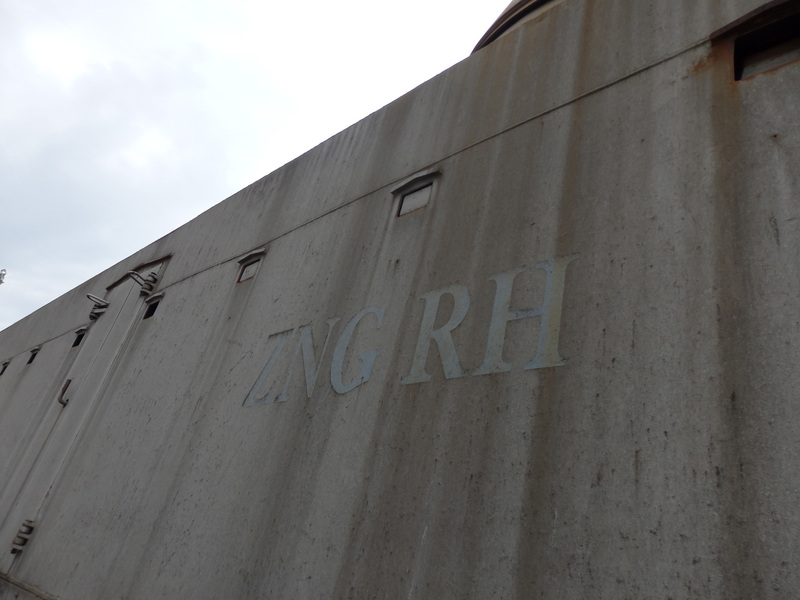 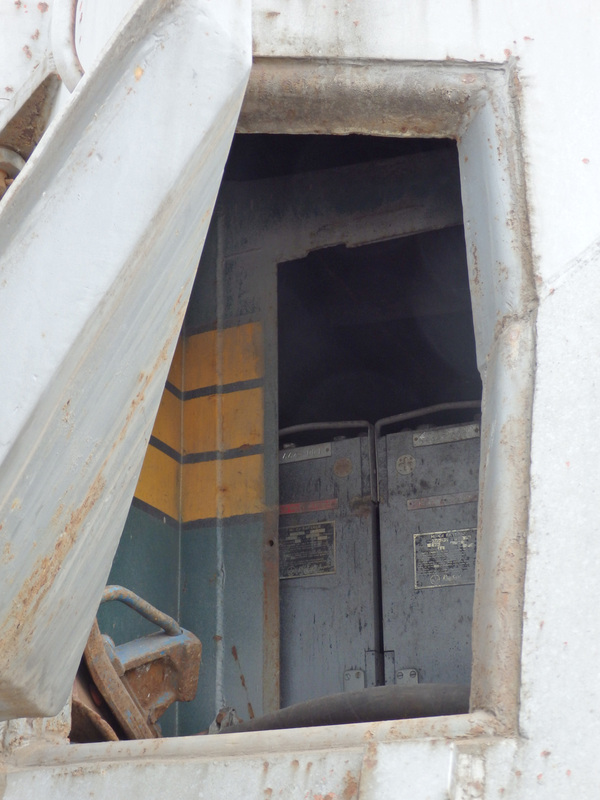 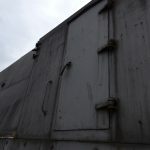 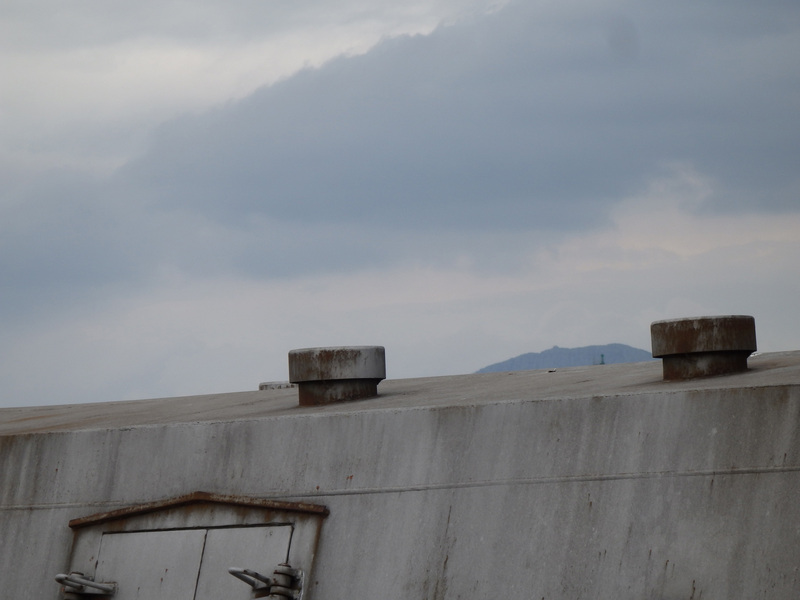 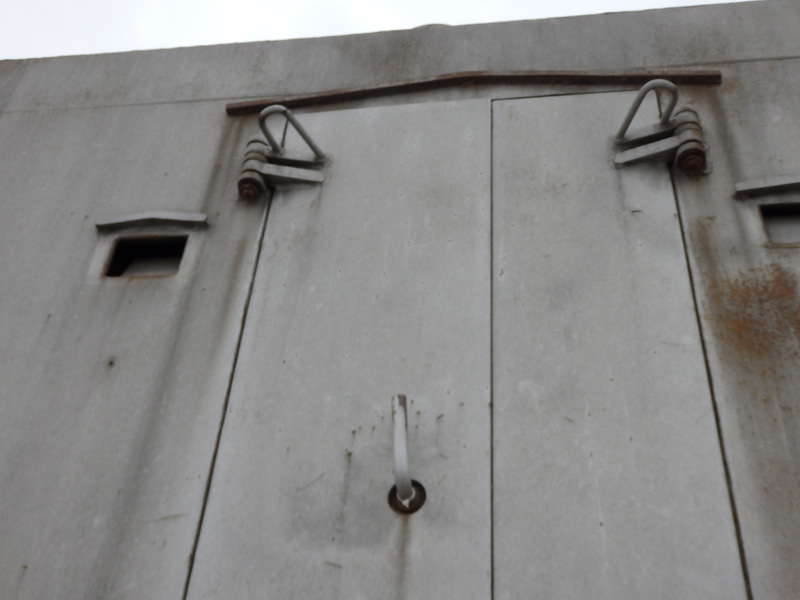 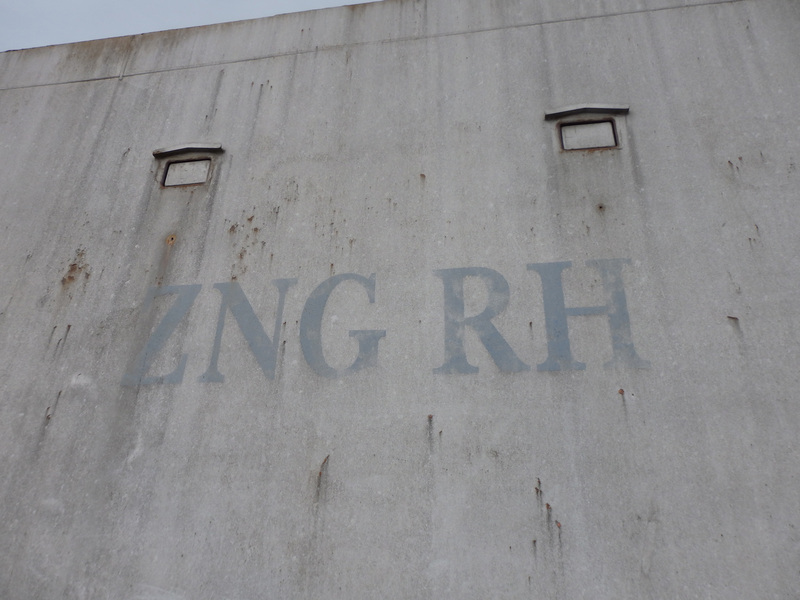 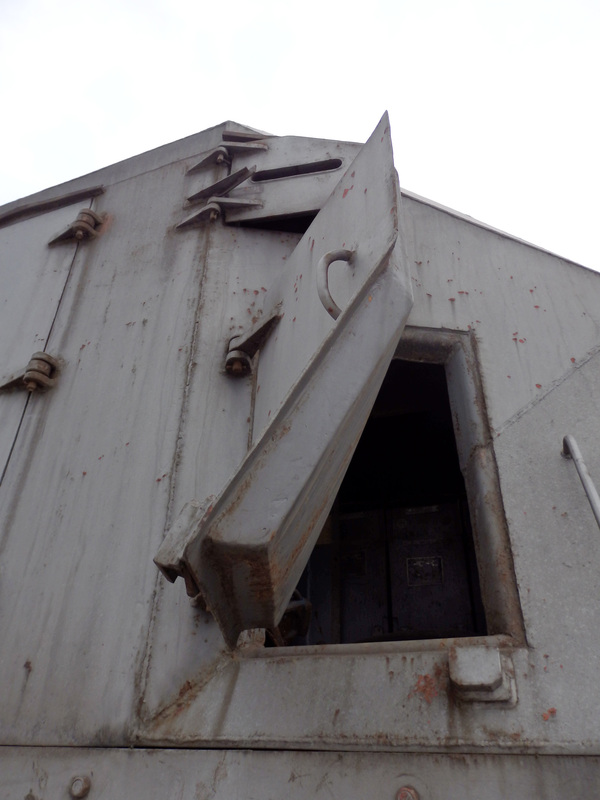 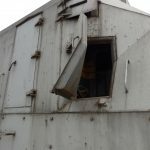 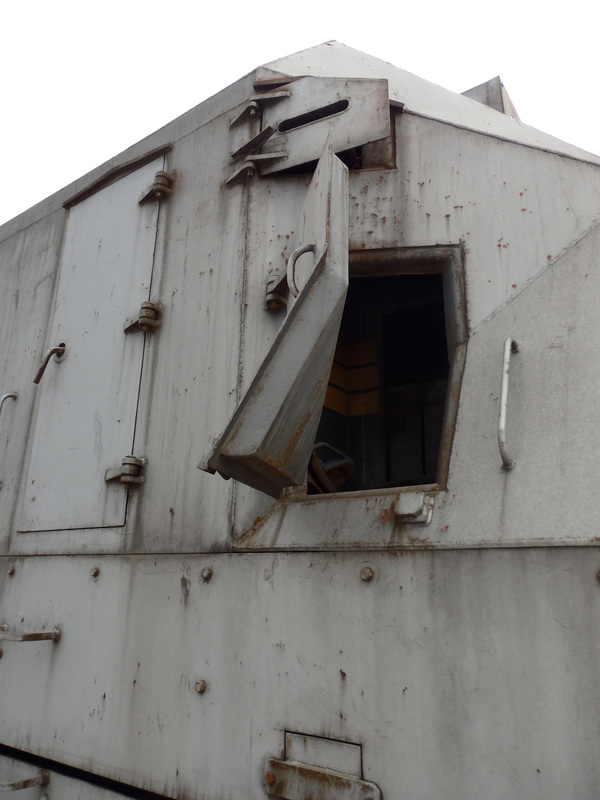 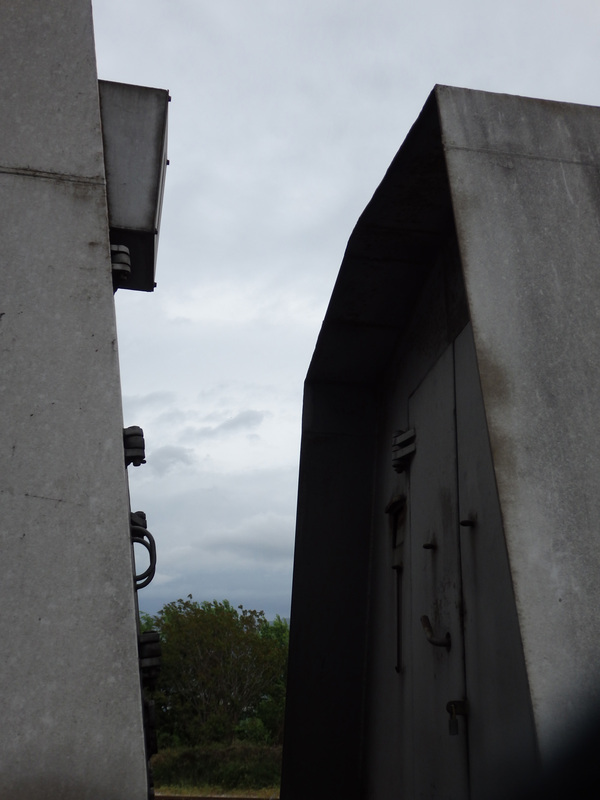 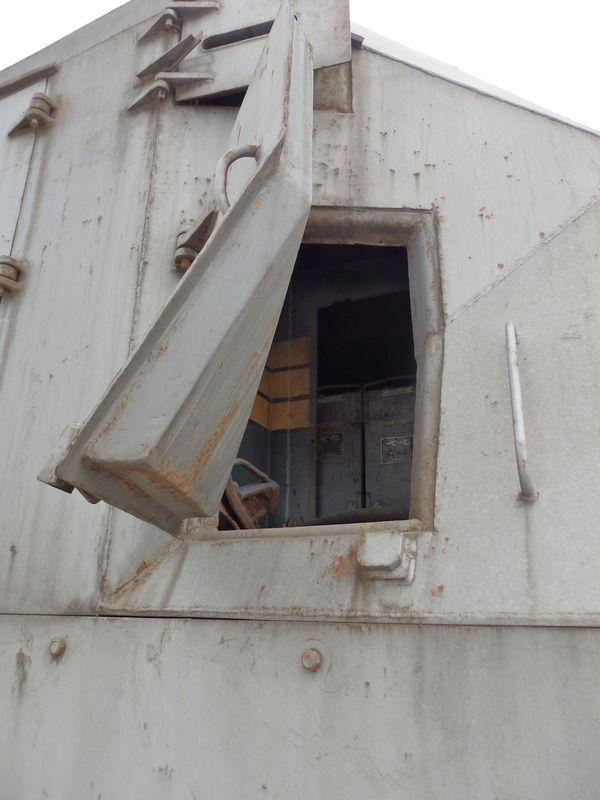 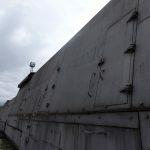 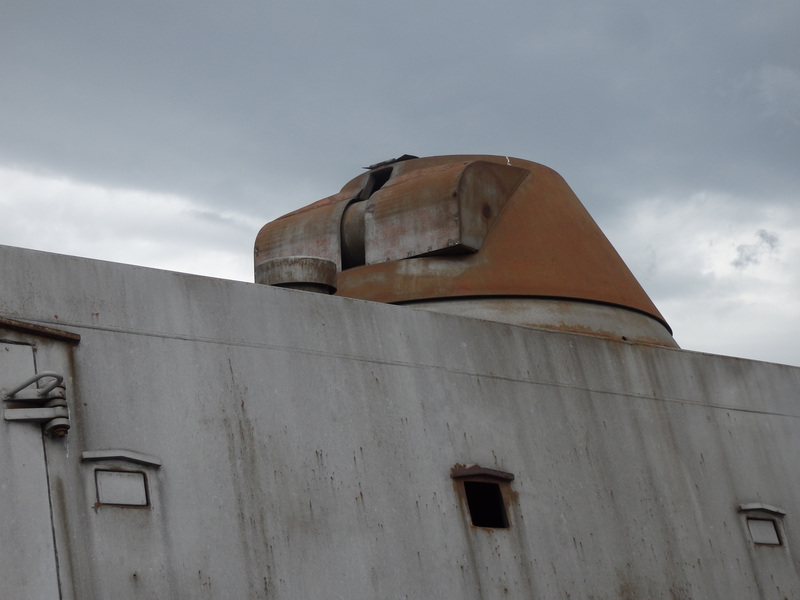 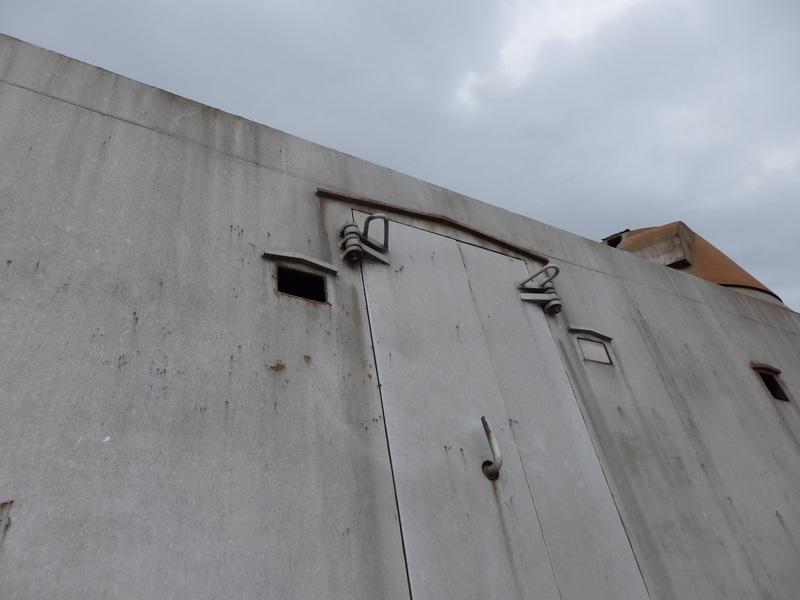 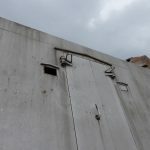 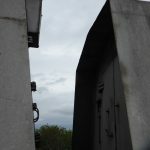 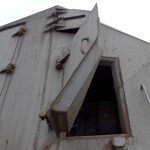 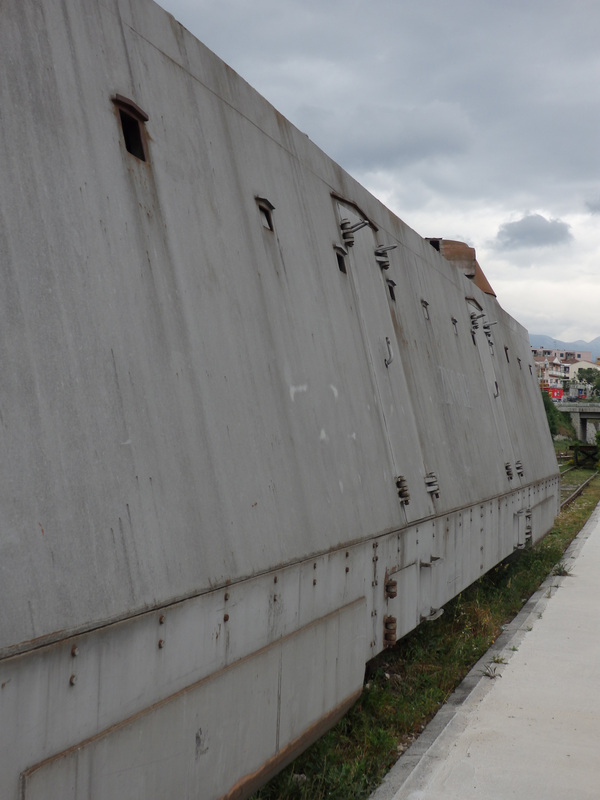 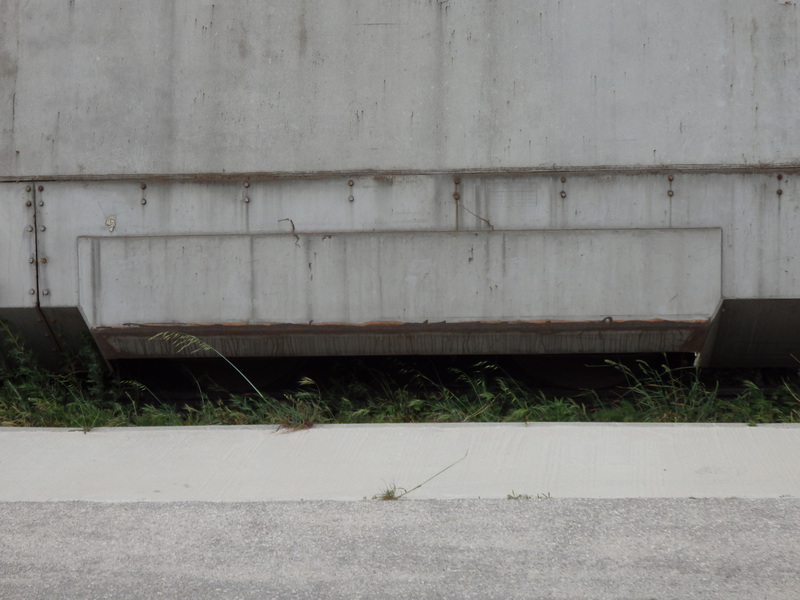 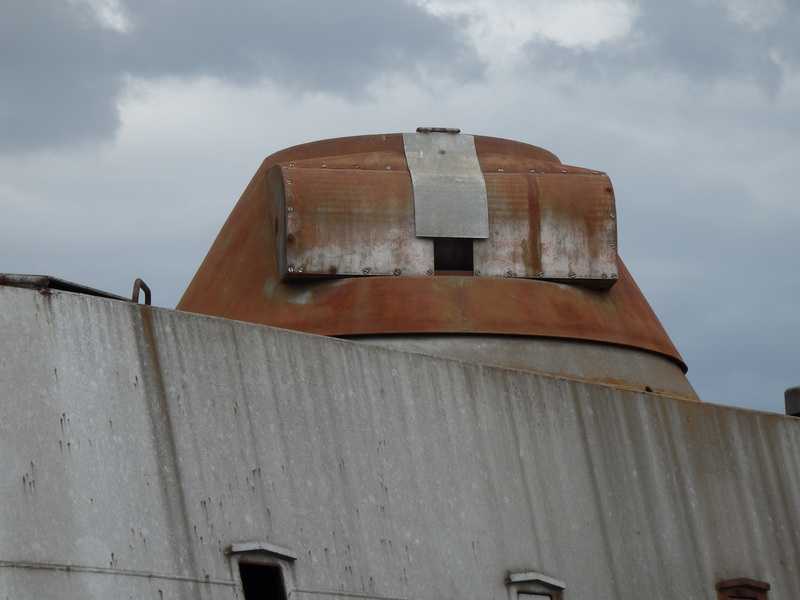 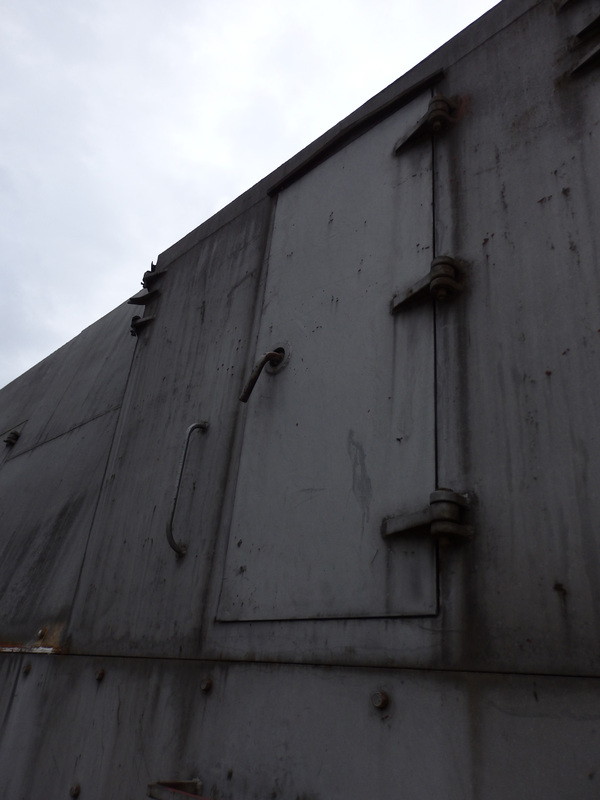 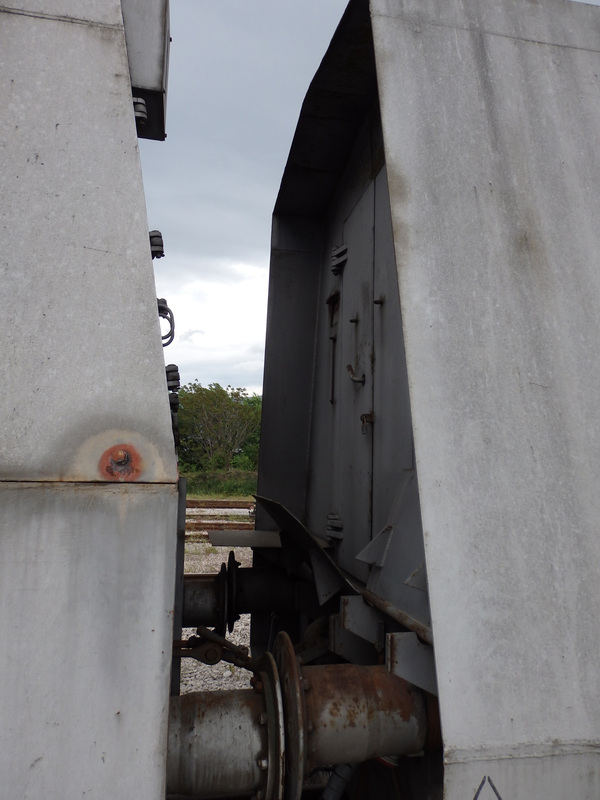 This is where the armoured train was in April 2015. 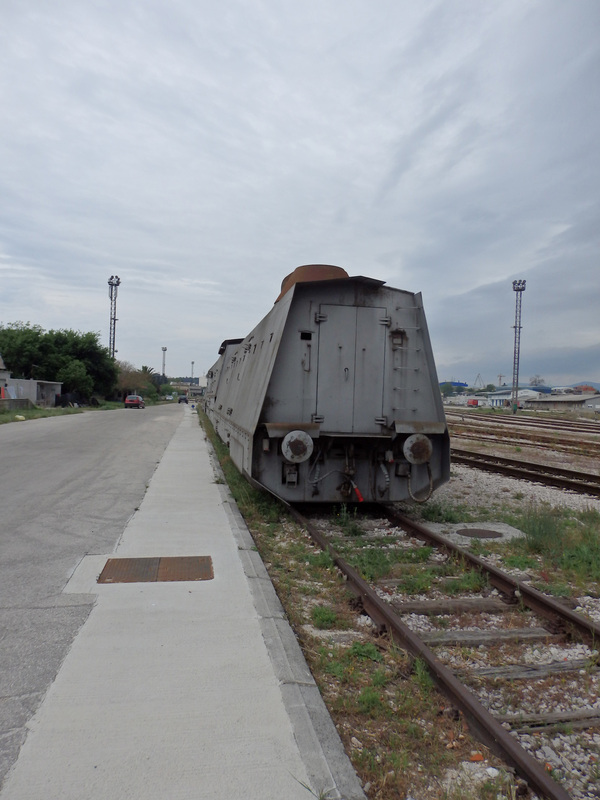 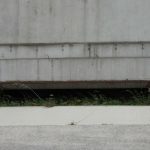 However, in February 2017 the train was not visible on Google Maps dated 2017, suggesting that it had been moved elsewhere.